After nine days or so of paragliding school, I have to make a tough decision. My right shoulder is aching and I’m losing strength in my right arm when I raise it above 90 degrees. This is the same shoulder I had rotator cuff surgery on about 4 years ago. I really don’t want to stop flying, but I also don’t want to cause damage that will prevent me from riding. So after 13 solo flights, including thermaling to cloudbase and ridge soaring, I have decided to stop. The rotator cuff is talking loudly and while I can mask the pain with medication, I’m afraid of continuing the damage. It’s time to listen to the rotator cuff. As always, when things are good and there is no pain, I ignore the opportunities to work out and strengthen my shoulder. When things get worse, I regret not being in better shape. Suprisingly, l didn’t expect shoulder problems. I expected knee or ankle problems from hard landings. Although I had a few less than desirable harder landings, I had no problems with my legs. I think the shoulder probably would have fared better if I had realized in the first couple of days what I was doing wrong with my upper body during launching, fighting the wing instead of finessing it. My instructor tried to explain it, but it just didn’t sink in until too late. 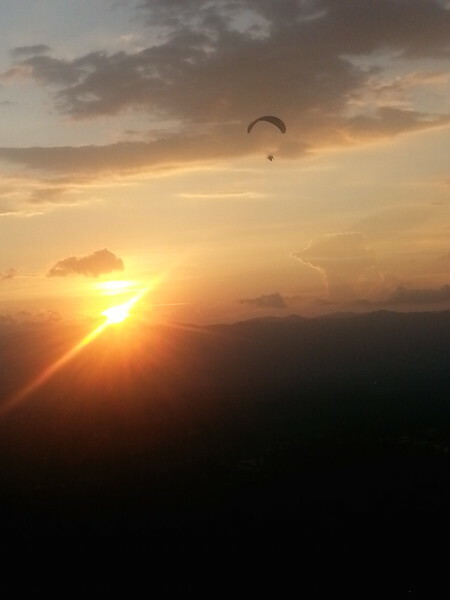 Regardless, I had a great time at a great location learning to fly a paraglider. It’s something I definitely want to continue in the future, but I will be better prepared with my shoulder before taking it up again. My current plan is to depart here tomorrow and head south. 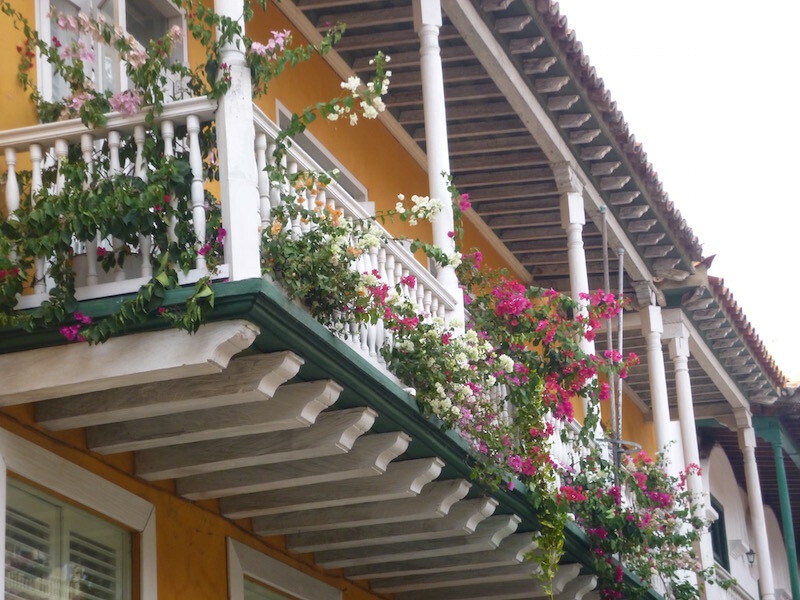 It will be tough to leave The Nest hostel at Colombia Paragliding. 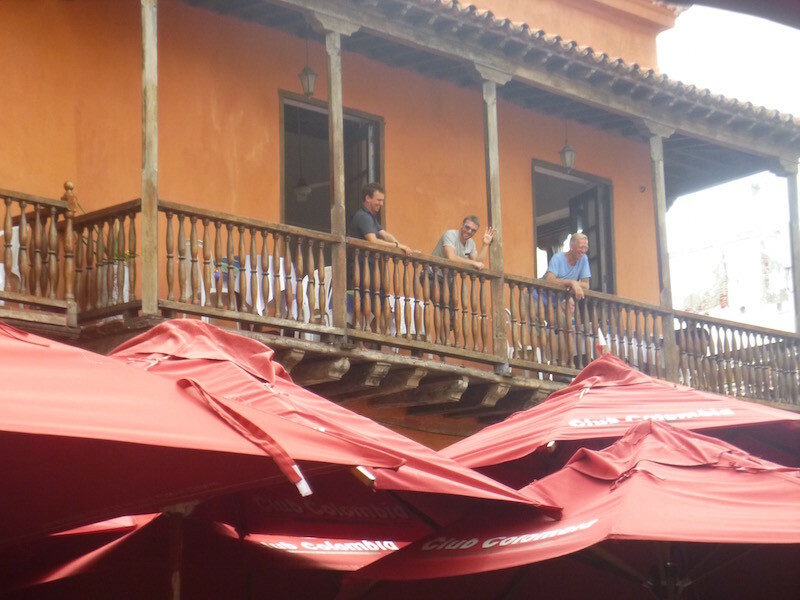 This place is very comfortable, with an incredible full breakfast (and an even bigger and better optional lunch), and you can sit on the porch and watch the paragliders all day. 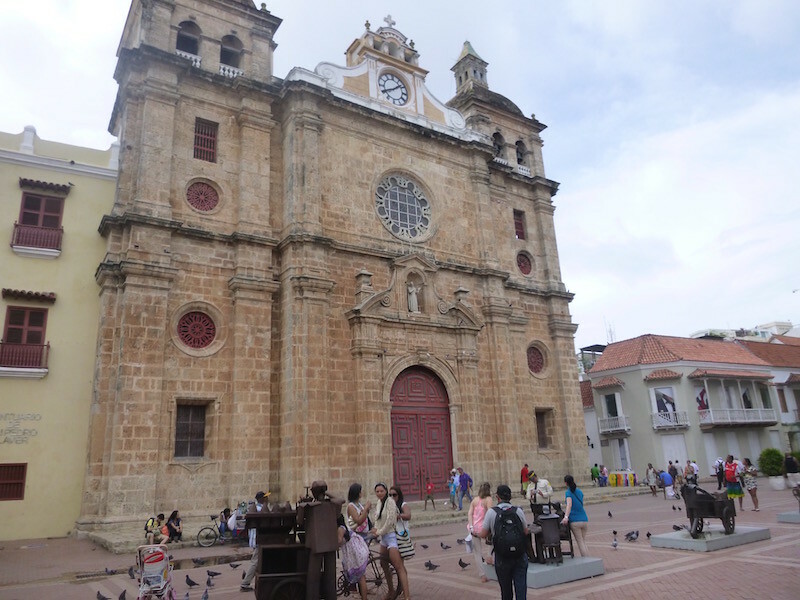 I still have another week of exploring Colombia before entering Ecuador, which is obviously not enough time, but there are a number of great sites I want to see here. 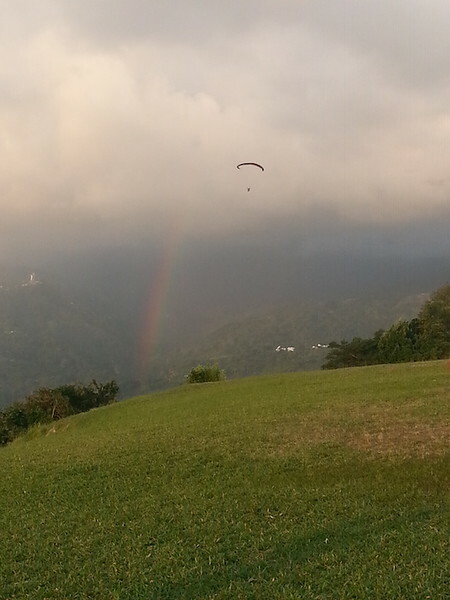 Just a quick update: I am still in Bucaramanga, Colombia attending paragliding school, known as parapente here. It’s also affectionately referred to as “Para-Waiting”, as in all geared up and waiting for the right wind conditions to launch. The conditions here at Las Aguilas are very predictable: no wind in the morning, clear skies, with heat slowly building, creating cumulus clouds and thermals by mid to late morning, which makes for good flying for a beginner like me. With the lift created by the thermals, I can launch from the site, which is about 800 feet above the landing zone, and climb another 800 feet or so. Without the thermals, on my early morning flights, I do what Colombianos call “piano”. I think it has to do with the sound a piano makes when you drag your finger from the highest to the lowest notes. That’s the sound of going straight from the launch site down to the landing site; about a five to minute ride at best unless I catch a little updraft off the hills. It’s too windy for a beginner like me to fly from about 11am to around 4:30pm, so much of my day is spent either studying or “kiting” — flying the wing on the ground and learning to handle it better. Then the wind dies down again and I (hopefully) get to fly again just before sunset. As of this morning, I have ten solo flights. I’m hoping to do another ten to fifteen over the next few days, which is possible but wind conditions will dictate. I am longing for the road, and ready to travel, but need to complete this course first. So stay tuned. I promise to be blogging from the road again by next Tuesday at the latest. I’ve been in the same place for several days now, but I haven’t posted anything and haven’t turned the tracker on, so I started getting emails asking if I was alright. So I figured I’d better post something. First off, yes, I’m fine. On my “to do” list when I started planning this trip was to learn to paraglide in Colombia or Peru. 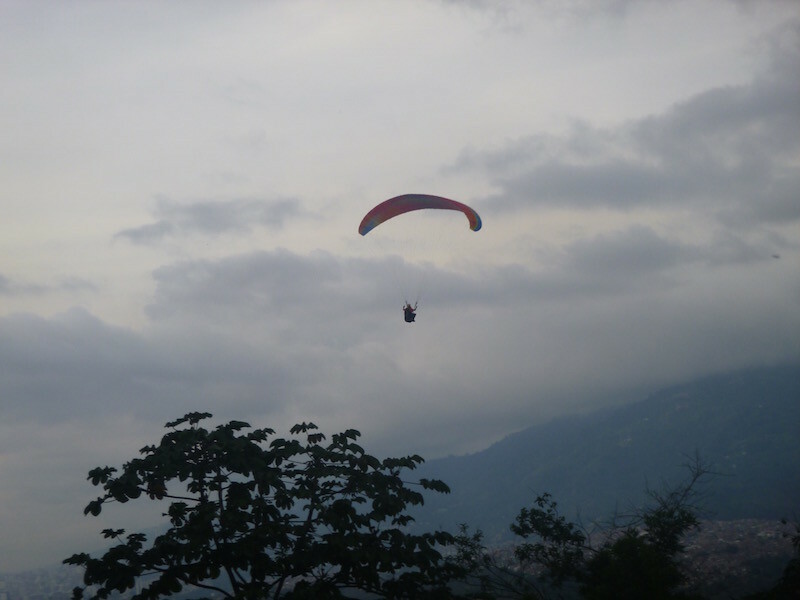 I decided on Colombia Paragliding in Bucaramanga. They have a hostel right next door to the fly site, so it’s quick and easy. Well, quick anyway. You have to look close to see the dot near the center of the photo. Photo taken from the launch site. After two days of lessons and another tandem flight with an instructor, I did three solo flights today. It’s important to note that there is no “bunny hill” here; your first take off is off a hill into the air and the ground drops away quickly until you are about 800 feet above the ground. The conditions here are very predictable, and each morning is very calm, followed by stronger (intermediate level) winds from about 11am until mid to late afternoon, when it calms down again. I’m exhausted from the first two days of fighting with the wing while on the ground, but the practice is obviously necessary. I’ll be here for another week before I head south. 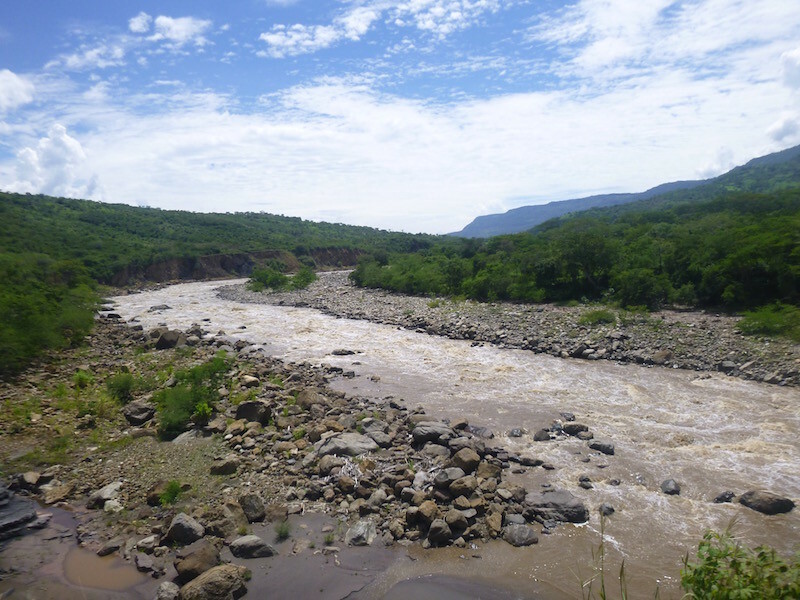 I’ll try to post a couple of more times as I progress, and I have Sunday off from school so I plan to go exploring….maybe find the road from this side (Giron) to Zapatoca after all. 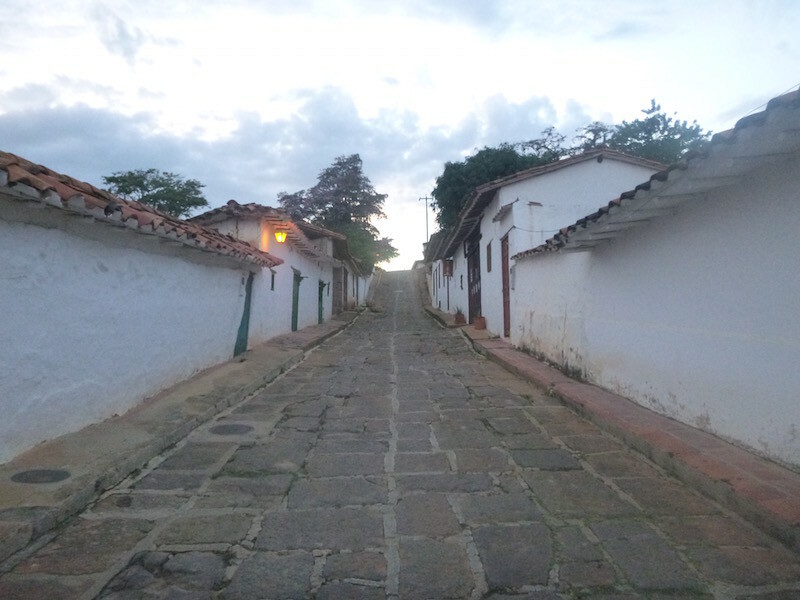 This morning I’m determined to ride to Zapatoca from Barichara. On Google Maps and Maps.Me I can see the road, even though both of those and my Garmin GPS tell me the only way there is back through Bucaramanga on the highway. I know better, and I will find the road. After breakfast in town, I walk to the edge of town and find the road heading out towards the valley and Galan. This is my first leg. Looking across the valley from Barichara to the small town of Galan. My first waypoint on the way to Zapatoca. I return to the hostel, suit up and ride out of town. 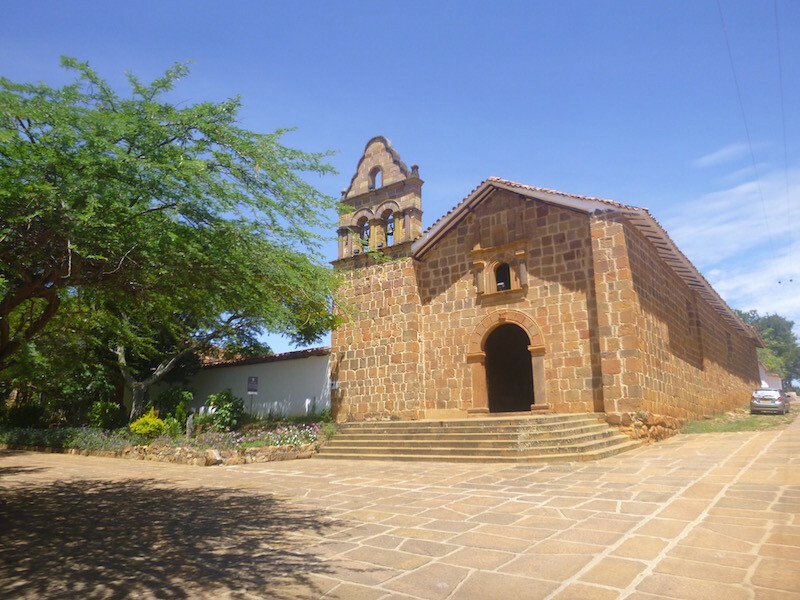 About 10 kilometers down a beautiful small paved road I am in Guane, just as church is letting out. It’s a very quaint tiny village, but it’s once again at the end of the road. Backtracking a few kilometers, I find an unmarked dirt road. Maps.Me says this is it. A few kilometers later and I can see the bridge over the river below me. At least I know I can get to Galan now, and if I can get to Galan, I can get to Zapatoca. Bridge over Rio Suarez heading to Galan. The bridge could use a little maintenance. There are several of these holes that you can look through all the way to the river below. The dirt road is a bit rough in places, but overall it’s a great ride. The views of the canyon are huge. 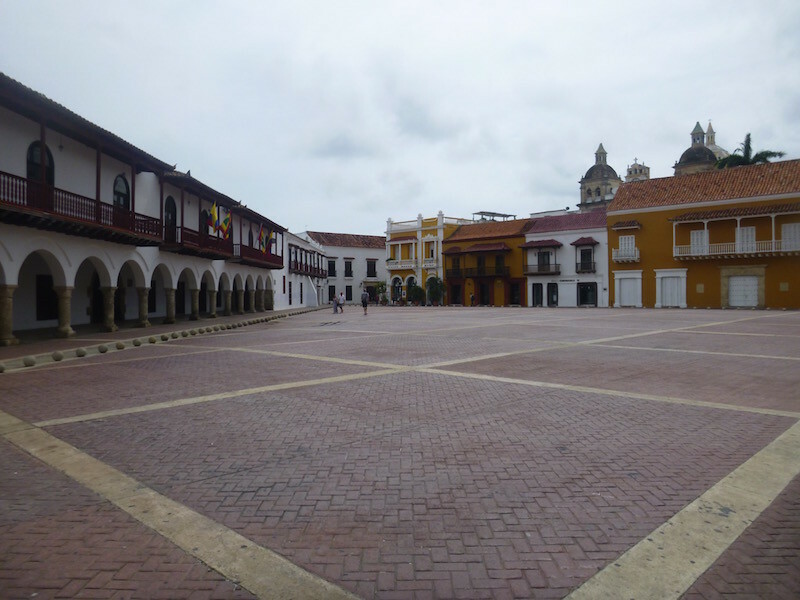 I pass through Galan and La Fuente, each about eight blocks square (standard Colonial layout) with the entrance in the southeast corner and the exit in the northwest corner, forcing me to ride through town, typically around the town square in the center of the village. 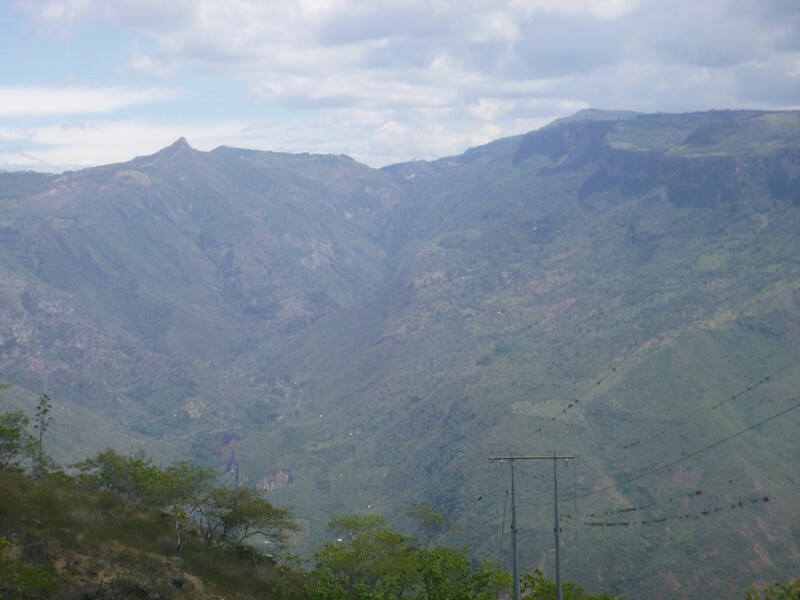 Climbing up to Zapatoca, the road runs along the edge of the valley for a good distance. 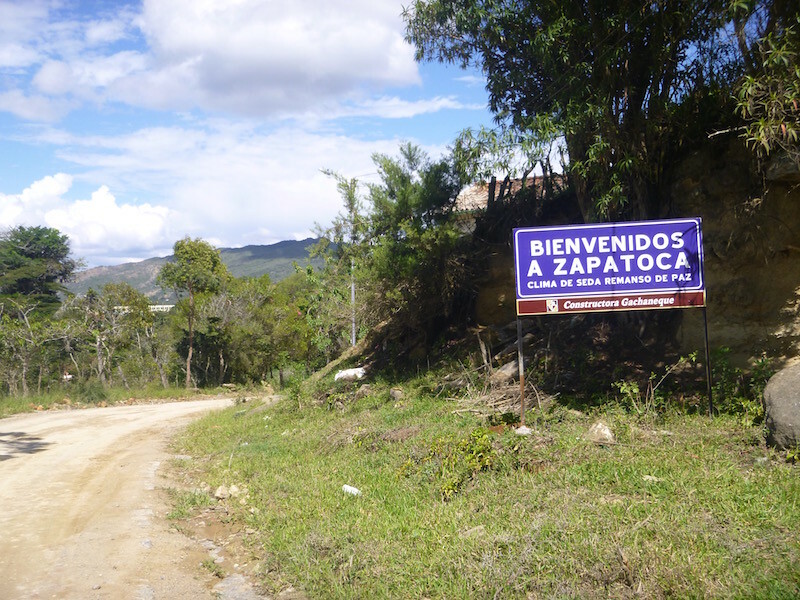 After La Fuente, it’s about another 20 kilometers to Zapatoca, where I stop for lunch and refuel before heading back. I am relieved that I was finally able to find this road, and glad that I didn’t miss it. The scenery is worth every minute and every rock on the road. This would be a perfect off-road excursion for a BMW or my Super Tenere, and I wouldn’t hesitate to do this route two-up on a big bike, as long as it isn’t raining. There are definitely places on the road that would be extremely slick if it was raining. That said, it rained last night in Barichara, and the road was in good shape this morning. Great road conditions for a day trip. When I ask if he needs help, he points to the piece of inner tube sticking out of his rear tire. I quickly determine that he has ridden with the rear tire flat long enough that it has torn the valve stem from the tube. I pull out my tools and begin to remove his rear wheel. The police decide that I have things under control and they leave. Two more guys ride up on a scooter. They are clearly friends of the guy with the flat tire. With the wheel off the bike, I use my tire irons to remove the tire and tube, and pull a new tube from my pannier. At this point the three of them are looking at me like I just landed here from Mars, and I can understand. When was the last time one of them had a flat, and some guy from the U.S. rolled up, produced the correct size inner tube, and installed it while they watched? Likely never. New tube installed, I use my air compressor to inflate the tire and reinstall the wheel. Good to go in about 20 minutes. During this time, the poor guy has tried to help a few times, but mostly they’ve been discussing how much this is going to cost him. So when he asks and all I say is “Buen viaje” (good travels), he is a bit stunned. 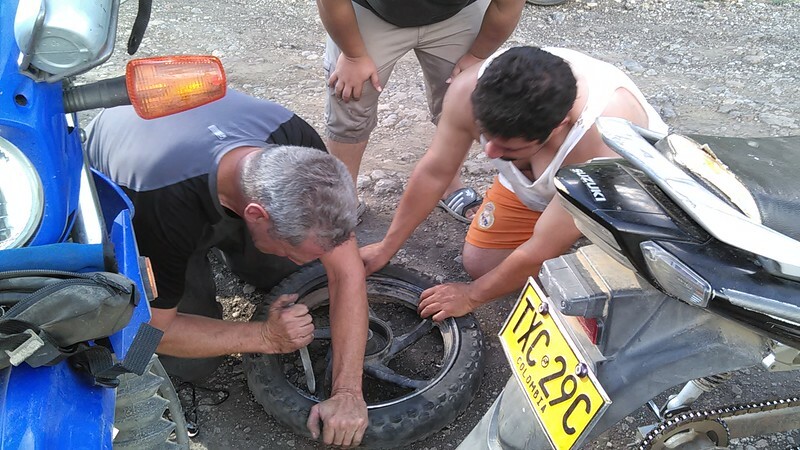 I figure karma is a good thing, and I can’t help but think about the story he will tell at the bar for the next week or so about this American guy that just showed up out of the blue and fixed his flat for free. 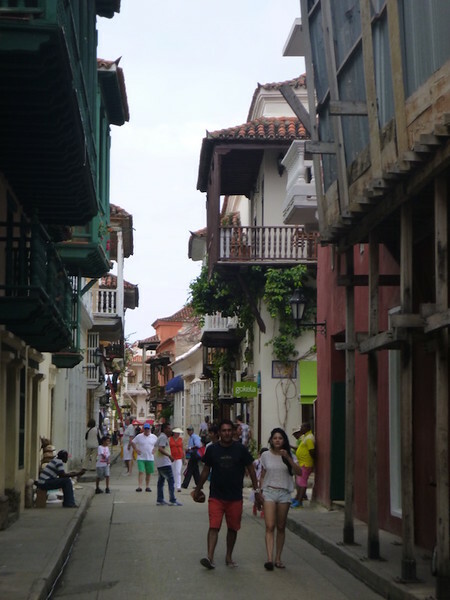 Colombia and its’ people have been good to me. A little payback was in order. It’s a few minutes after 8am when I hear someone call “Patricio” from the kitchen. Is someone calling me? “Patricio!” she says louder. I walk out of my room, and sure enough, Mom is calling me to the breakfast table with a big smile. My breakfast is ready and she doesn’t want it to get cold. The Colombian warmth is still catching me by surprise. At breakfast I meet yet another Swiss traveler who has been here for six weeks, learning to paraglide. She says she had no intent to do this, but circumstances fell into place, and she has fallen in love with the sport. Now she is struggling with the reality that her visa will expire next month and she must return home. I suppose there are worse places to return to than Switzerland if your first love is paragliding. I’ve been looking forward to today’s ride for quite a while. 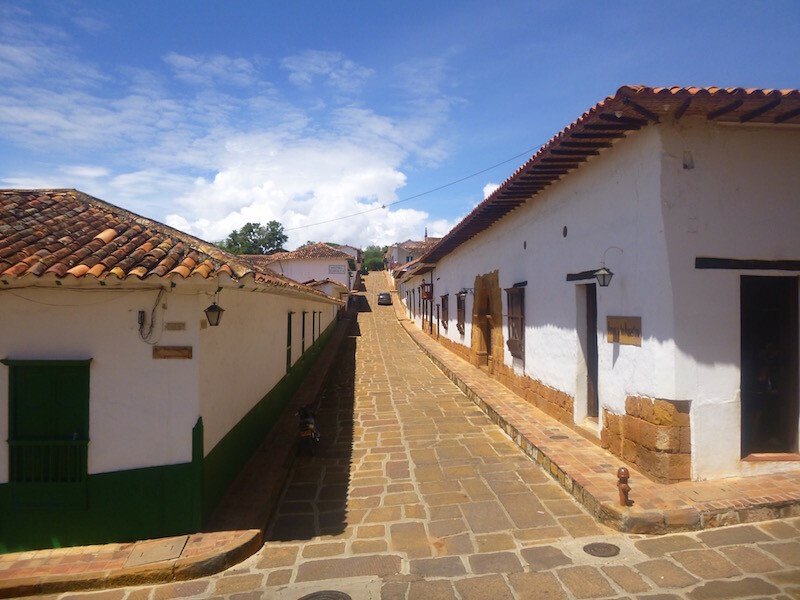 There is a back road from Giron, on the edge of Bucaramanga, along the mountains through Zapatoca and eventually down across the Rio Suarez then back up and into Barichara. The whole thing is only about 120 kilometers, and it should take about 4 hours. Last night I looked at Google Maps, and at my Maps With Me app, and I found that the road in front of the hostel is a shortcut across to the road to Zapatoca. 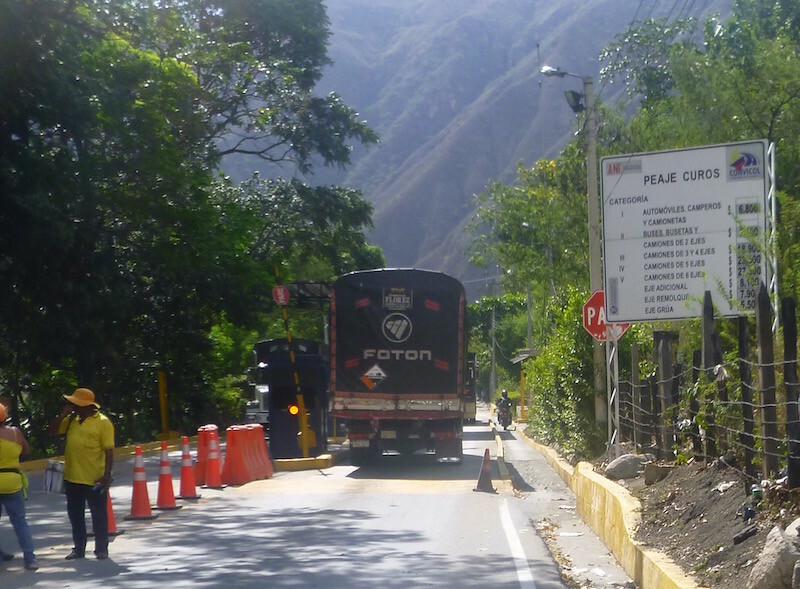 So I don’t have to go back down the mountain and through Bucaramanga to Giron. I head further up the hill to Ruitoque and beyond. The road turns to dirt. Then it gets narrow. It passes through a small village, down a hill, and along a farm, where it dead ends into someone’s house. I check the GPS. It says turn around. Huh, no kidding. I check Maps With Me. It says the road continues through the guy’s house. I think I’ll skip that attempt. 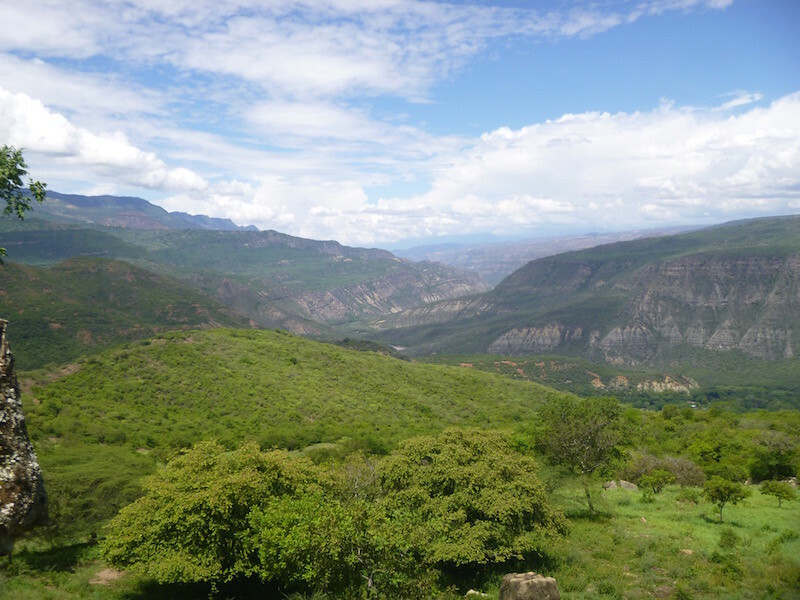 Having started a bit late, I decide to head back down the mountain and just follow Highway 45A south towards San Gil. 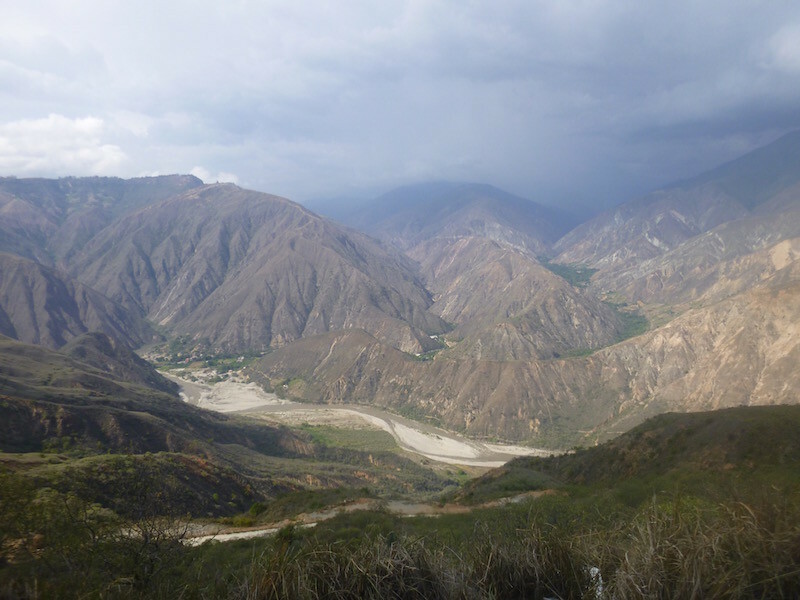 Chicamocha National Park and Canyon are on this road, and are supposed to be worth the stop. 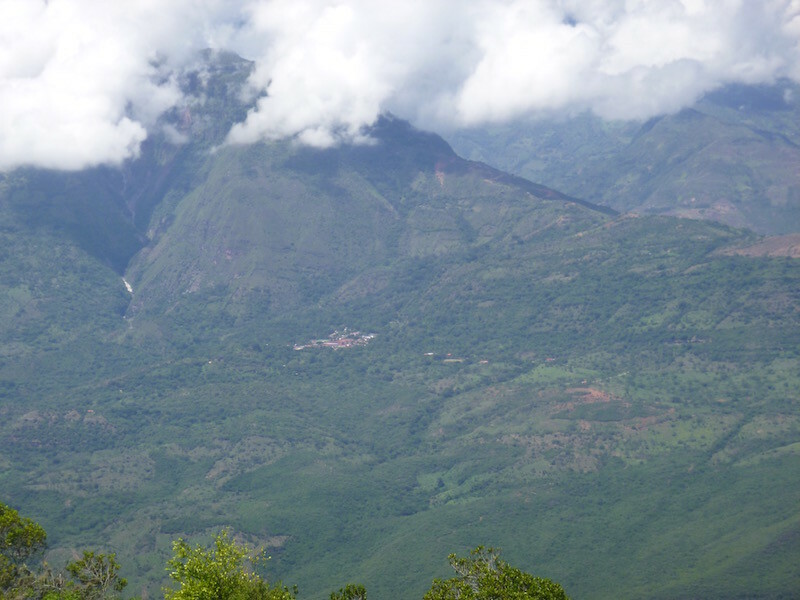 About 10 miles further south I spot a sign that says “Chicamocha Mirador” pointing up a road to the right. I turn off and start climbing. It’s a good road, and fun. In about eight miles I’m at what seems to be the top, but I haven’t seen the Mirador yet. I keep going. For fun I put Zapatoca back in the GPS. Incredibly, it says this road goes there. Okay, here’s my second shortcut attempt. Highway 45A runs along a ridge, between two canyons. This one on the east side is fairly brown but the colors are nice when the sun hits it. The other side is much more green. Highway 45A isn’t a bad road itself. The scenery is beautiful for much of the ride, and the road is twisty and climbs through the mountains. Aside from having to pass a number of large trucks that are straining to climb the hills, it’s a relaxing ride. At one point as I’m running along at my usual 50mph (80kph), a car in front of me kicks up a black plastic bag. It flies towards me, and in an odd moment, it hooks on the GoPro mount on top of my helmet. Suddenly my head is attached to an open parachute at 50mph. It takes several seconds struggling with the bag to get it untangled from atop my helmet. That’s a new experience. Shortly after, I get stung by another wasp, in the same spot as a few weeks ago (on my collarbone). It stings, but it’s the annoyance of knowing it’s going to itch for several days that really bugs me. I suppose the wasps and unintentional helmet parachutes just add to the adventure. At least that’s my take on it. Most of the main highways are toll roads, but motorcycles are exempt from the tolls. If you look to the right of the truck, there is a small lane for motos. No, that is not a sidewalk. You see some really strange things while riding through other countries. This might be one of the strangest. 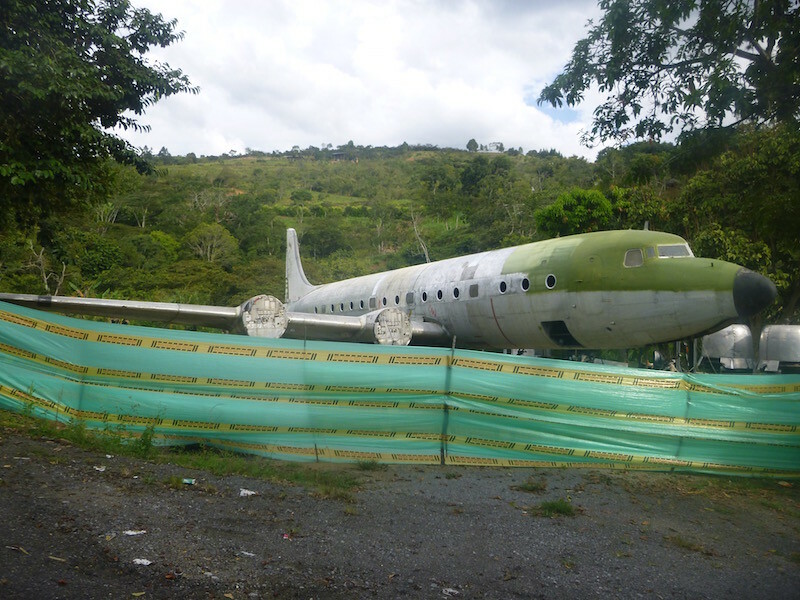 This is sitting in somebody’s front yard. 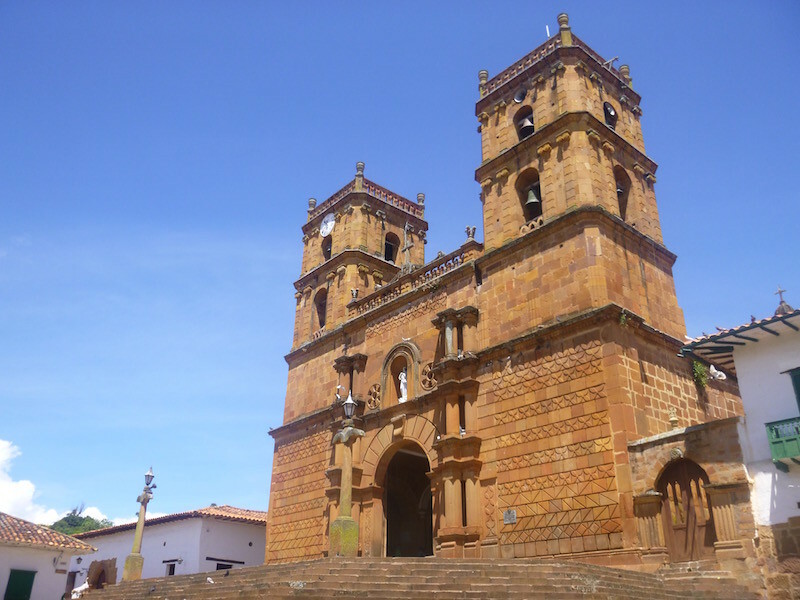 I finally arrive at Barichara mid-afternoon. It’s hard to describe the feel of this town; both beautiful and somewhat creepy at the same time. It’s Saturday afternoon and the town feels deserted. 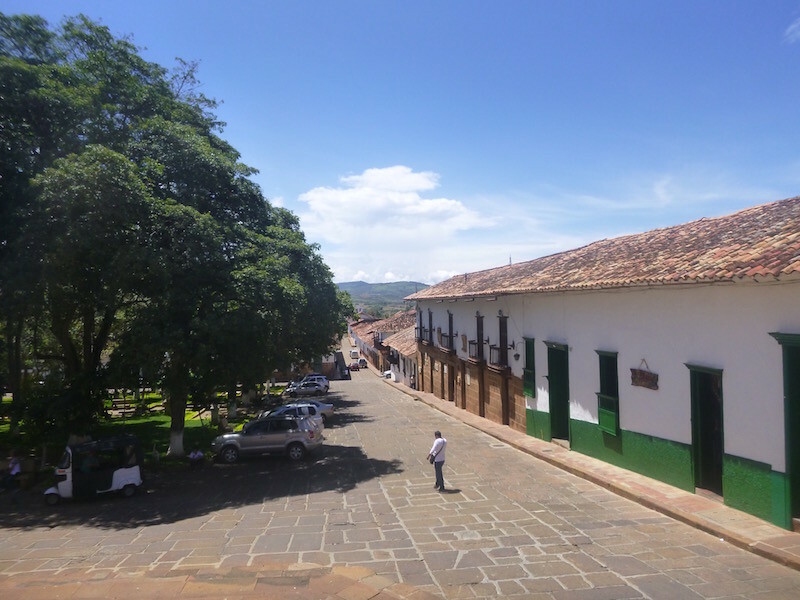 The wide stone streets are laid out in a perfect square pattern, and the entire town is painted entirely white, with a bit of green and a few blue doors here and there. 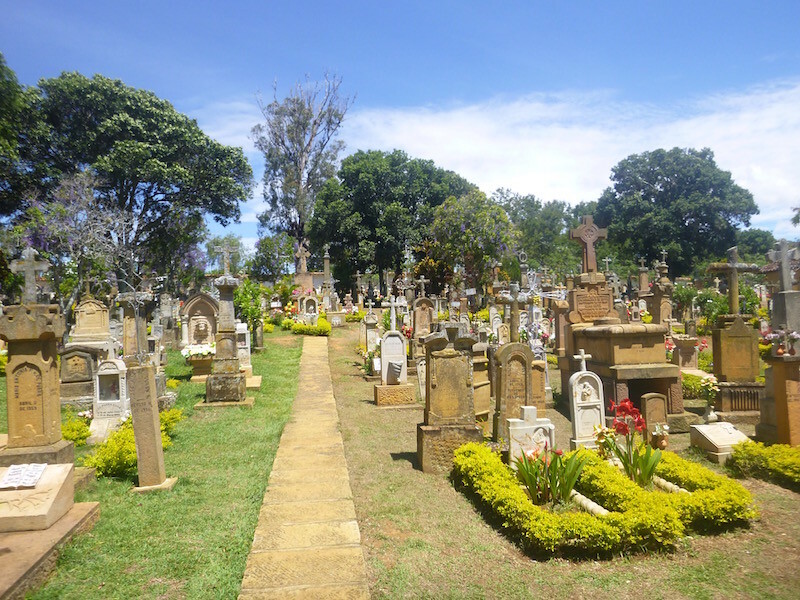 The cemetery is actually quite beautiful. I’m staying at the Tinto Hostel, which came with good recommendations from other travelers. I’m not as impressed, but overall for the price it’s nice enough. And as always, it has secure parking. I realized last night that I had inadvertently left my Delorme InReach GPS tracker set to record once an hour, which was fine on a sailboat moving at 7 knots, but it doesn’t leave much of a breadcrumb trail at 85 kmh. I reset it this morning, so the tracking should improve again, for those following my “Where am I now?” link. Leaving Mompox I am expecting 50 to 60 miles of rough dirt road before I get to Highway 45. I am pleasantly surprised to find pavement. Well, mostly pavement. Well, it used to be pavement, not that long ago. There are still nice stretches of smooth tarmac, sometimes for miles, but in other places, it has deteriorated into a mass of potholes and troughs, and I have to pick my way through slowly. As usual, there are large trucks and buses going the other way, and they not only have to use the same tracks through the holes, but they seem to pretend that I am invisible. If we are approaching the same track, it’s not a matter of who gets there first, it’s always simply who is largest. And I lose every time. Often I have to move not just to the edge of the road, but off the road, if they are using a track that leads all the way to my side of the road. The pavement stops as I enter Guamal, a small town on the other side of the river (there is a bridge this time). It’s odd that the roads are paved up to the towns, but all of the streets in town are dirt. I pick my way through Guamal until I find the road leading out of town. It stays dirt for a few miles, and topes are replaced by large irrigation canal crossings about four feet high. At this point I’m wishing I had a YZ250, with no luggage. These things would make great jumps at speed. Back on nice pavement after refueling in El Banco. Ahead of me I see a group of six to eight motorcycles approaching. Locals on their way to work. Eight motorcycles and a trailer. Just a trailer. A two wheeled cart, about four feet by five feet, with bicycle wheels. Not attached to anything. Obviously it was attached to one of the motorcycles just prior to now, but it has detached and is traveling with the group independently. It’s moving about 35 mph and so far has managed to stay in their lane. I’m thankful that the builder of this trailer did a good job of aligning and installing the wheels. It passes me, half in each lane, and I continue on. 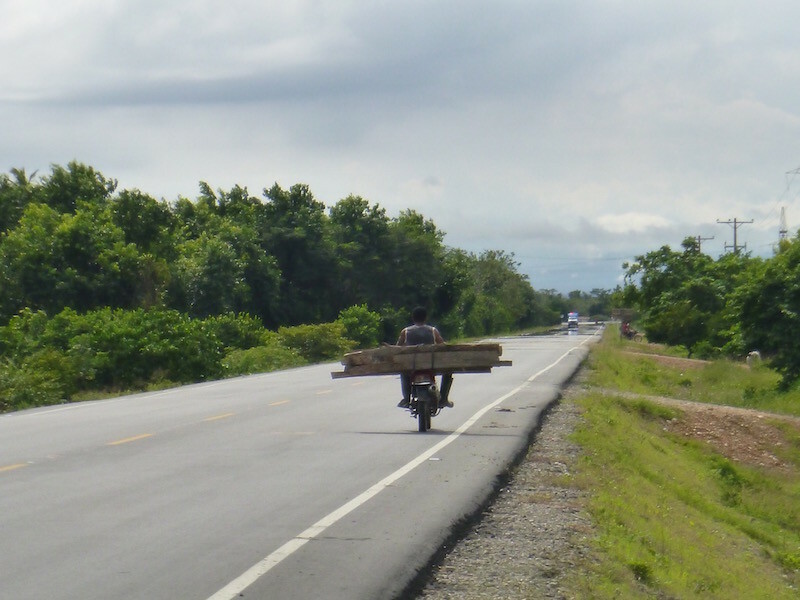 Keeping in mind that motorcycles are the cars and pickups of Latin America, when it’s the only transportation you have, you carry everything on it. On this day I passed this guy, with the equivalent of 6-foot-long railroad ties on the back. That’s a balancing act, front-to-rear and side-to-side. Yesterday, I passed two guys on a bike, and the passenger had a live pig in a bag under each arm. I’ve also seen guys carrying 20 foot sections of rebar, large spools of electrical wire, you name it. Highway 45 south is straight and not much to see until I get past San Alberto, where it begins to climb into the hills. Now the road is fun and twisty for the next thirty miles into Bucaramanga, which appears on the opposite hillside as I descend into the valley. 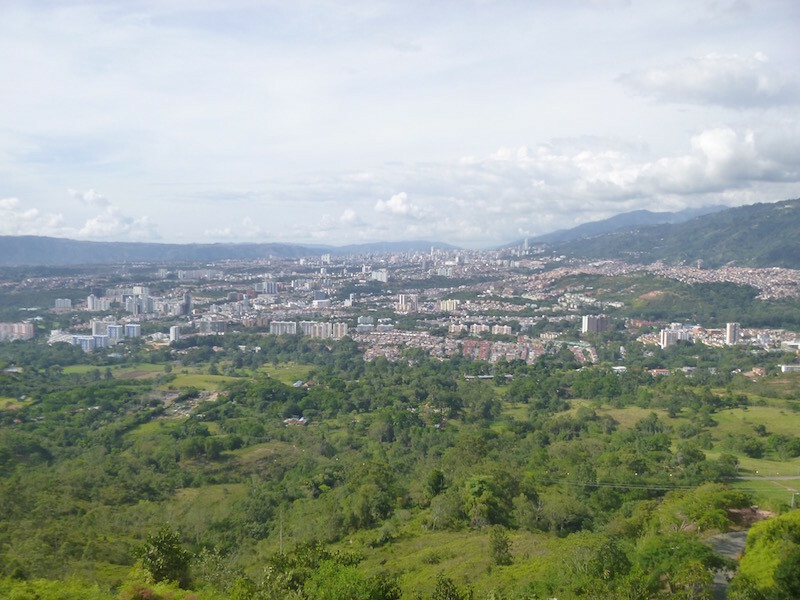 Bucaramanga is a much larger city than I had expected, with a population over half a million. Although the highway goes around town, I end up going directly through the center of it on surface streets in order to get to my destination for the evening. At each stoplight dozens of motorcycles and scooters thread their way to the front of traffic. I do the same as long as my wide panniers will fit. A few riders stop next to me and just stare at me and the bike, like I am from another planet. 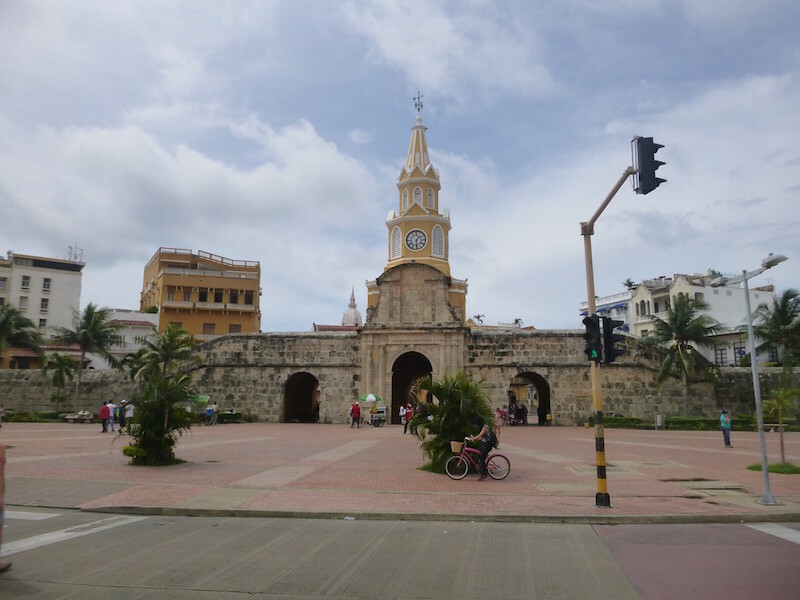 But more often, riders pull up next to me and give me a thumbs-up, shouting “Bienvenidos a Colombia!” I am experiencing what I have heard about prior to this trip: Colombians are incredibly friendly. 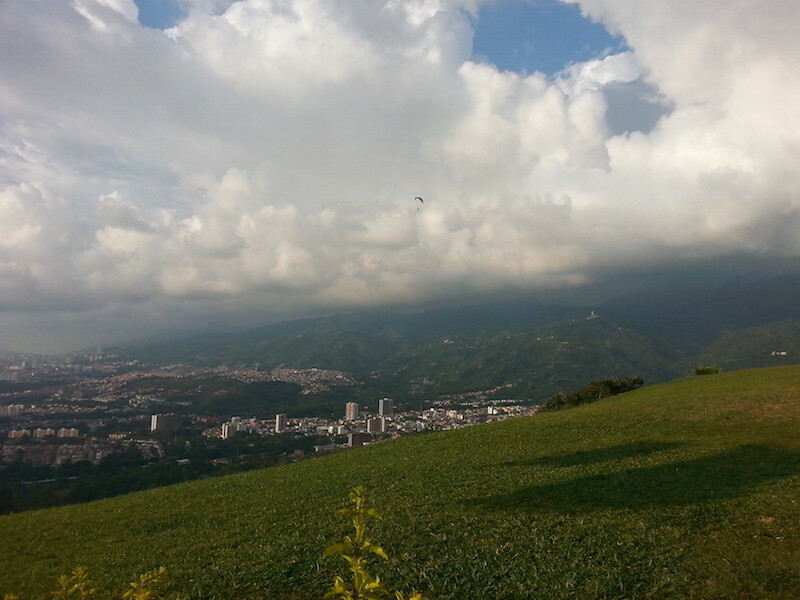 On the south side of town I climb sharply up a hill to Parapente Colombia, a paragliding site high above Bucaramanga. Next door is a hostel with parking for the bike. I pull in, unload and spend the rest of the afternoon watching the large wings float gracefully just above me. The hostel is “cat friendly” and my roommate for the evening is nearly identical in appearance and attitude to my own cat Dexter, who I miss a lot. Dexter Imposter. I called him Ed, for Extra Dexter. Is This The Road To Mompox Or Not? On Thursday morning, it’s finally time to hit the road. I’ve decided that as much as I wanted to head north and visit a couple more beaches, I’m ready for a break from the heat and humidity of the coast. 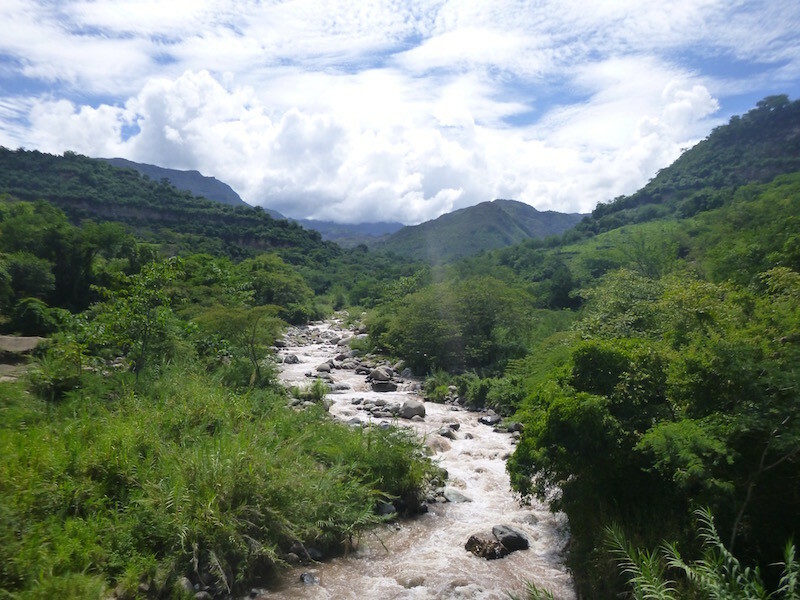 I ride out of Cartagena and head towards Medellin, but after about an hour I turn left and head further inland toward the mountains. The road is nothing special, and the potholes increase. 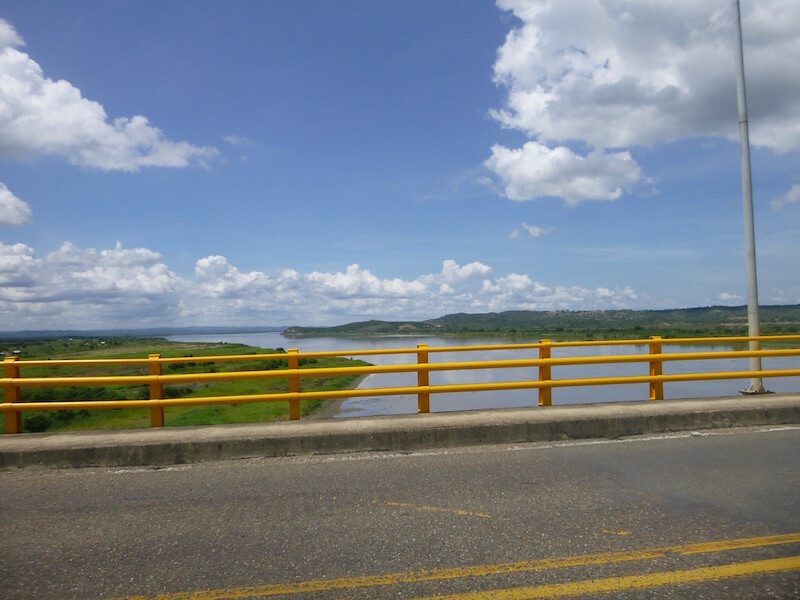 I’m headed for a small town called Mompox, on the Brazo de Mompos River. 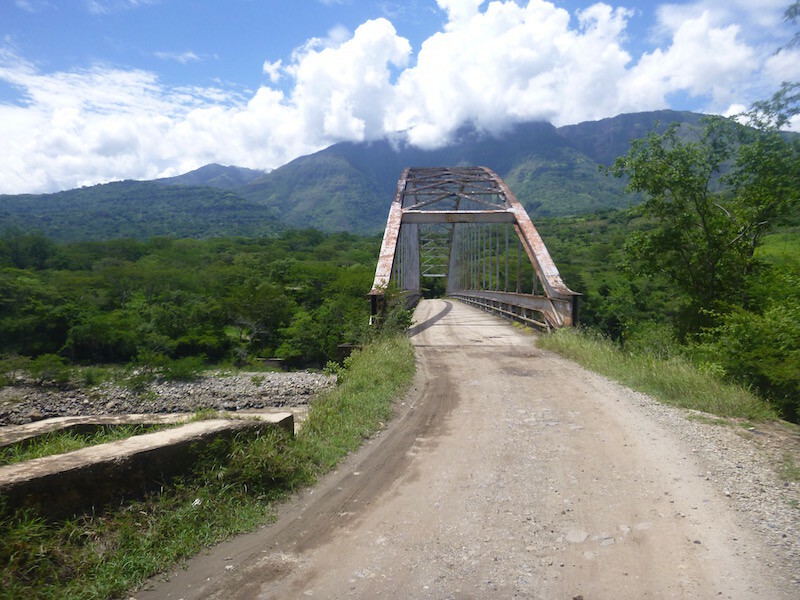 River bridge on Highway 80 at Plato, headed towards the turnoff to Mompox…I think. For an hour, my GPS continually tells me to make a U-turn and go back to the Medellin highway. But the Maps with Me app I use on my phone says there is a way across the river and that I can get there from here. I’m not sure, but I’m determined to find out. At La Gloria I turn south again and suddenly, inexplicably, the two lane road is nicely paved and the scenery is green pastures. After a few miles, I pass eight policemen on four motorcycles (they ride two-up here) headed the other direction. For the first time, I notice there are orange poles every couple of miles with blue “SOS” letters painted on them, the Colombian equivalent of a CHP Emergency Call Box. This seems very odd out here in the middle of nowhere, on a road that my GPS says is a dead end. 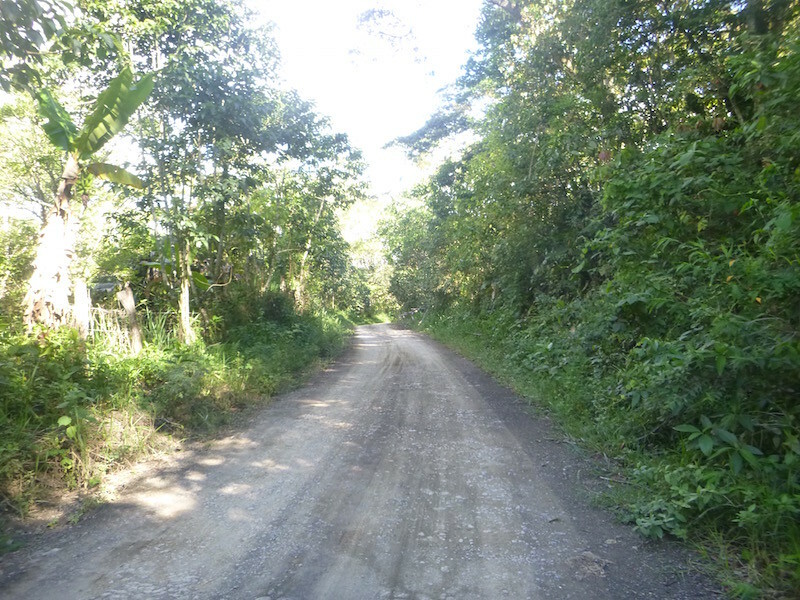 I’ve been watching the Netflix series “Narcos”, about the Pablo Escobar Colombia of the 1980s, and this road and the fincas along it suddenly remind me of the show. I’m sure my imagination is running wild. Today’s Colombia is much different. But I can’t explain the call boxes. I ride into the little town of Santa Ana at the end of the road, and my Garmin tells me just that: this is the end of the road. I stop and ask a moto-taxi driver if there is a bridge or a ferry to Mompox, and he tells me to go another two blocks and turn left. When I do, I am confronted by a giant, gleaming new concrete bridge over the river. But it’s not quite finished. For now, the tiny wooden ferry under the bridge is still in operation. 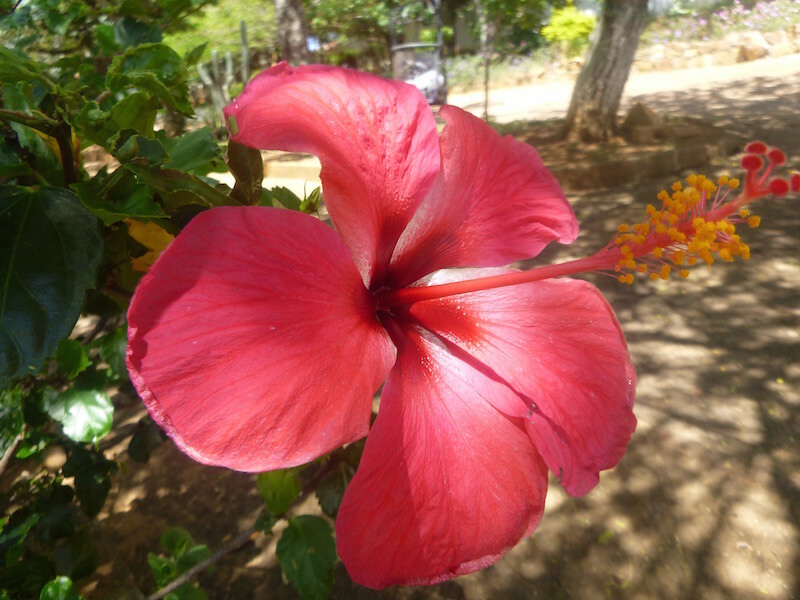 I pay the equivalent of sixty cents in Colombian Pesos and a few minutes later I’m headed the last fifteen miles down the dirt road to Mompox. Old crossing straight ahead; new crossing just above. 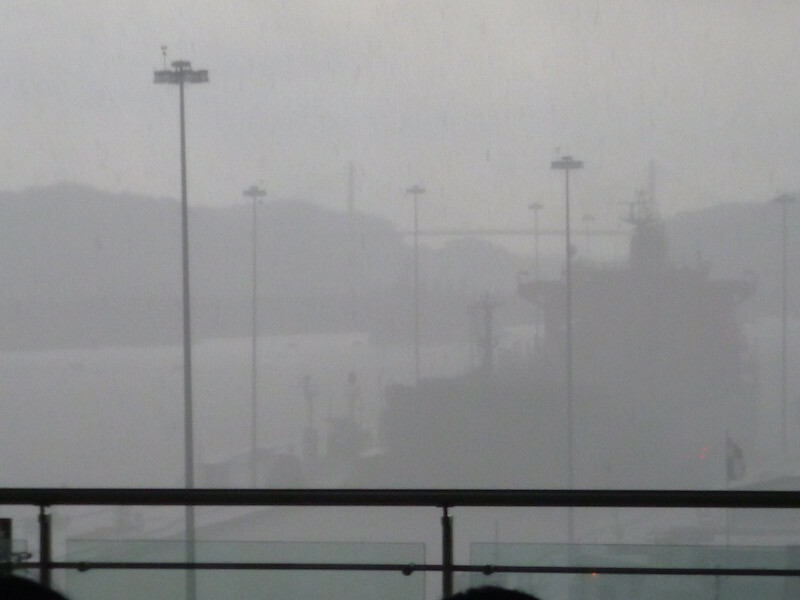 A bit hard to see, but this is looking across at the ferry. Wood planks across three narrow hulls. Mompox isn’t a tourist destination, but as I ride through town I spot a couple of hotels. The Hotel San Francisco looks nice enough, and it looks like I can probably get my motorcycle into the lobby, so I stop and ask. The guy at the desk is extremely nice, and asks another guest to move his car slightly so I can hop the curb and climb the step into the lobby. For thirteen dollars, I have a clean room with air conditioning, a ceiling fan, TV, and a clean shower. And always important, secure indoor parking. After a shower I decide to walk into town to look for dinner. Instead, dinner finds me. As I step out of the hotel, there is a street vendor at the curb selling patacones, a delicious fried mashed plantain with your choice of meat with veggies. Most likely the best eighty cent dinner I’ve ever had. Tomorrow is a long ride down a dirt road before joining the highway south to Bucaramanga. 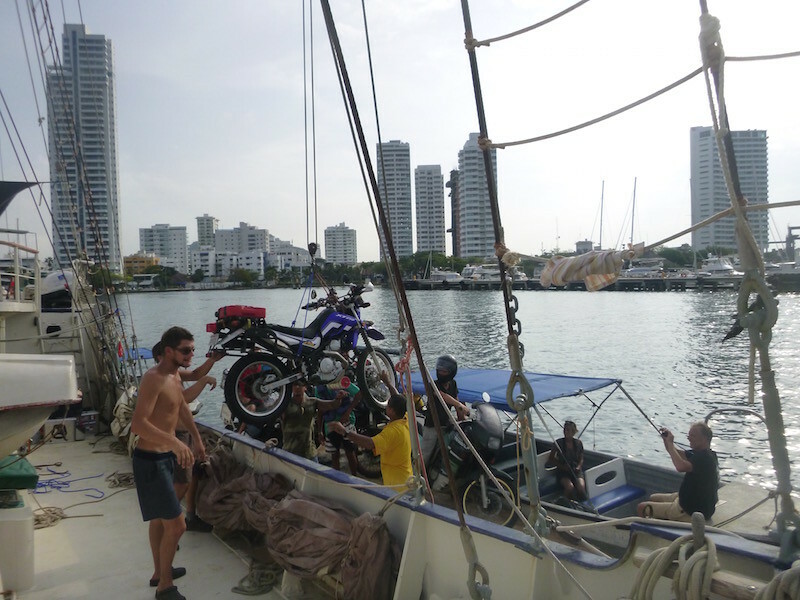 There are 18 motorcycles on the Stahlratte in Cartagena harbor. 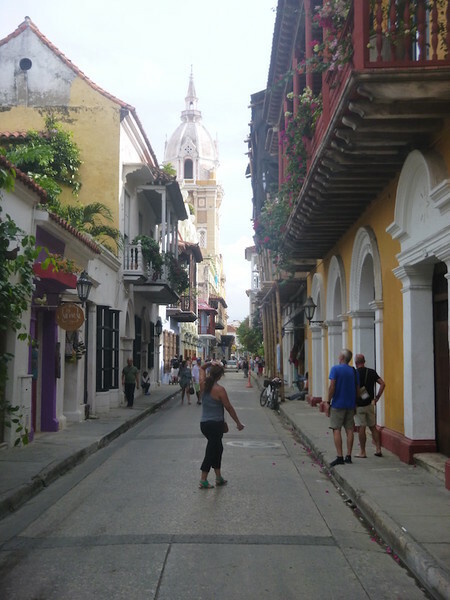 There are 23 of us spread around several hotels and hostels in the Getsemani district, just outside the walls of the Old City. This is an interesting place: the odd combination of backpacker tourists and red light district. During the day it feels like most other old Latin American cities I’ve been in over the past couple of months. At night it’s a little different. Not uncomfortable. Just different. Entrance to the old walled city. 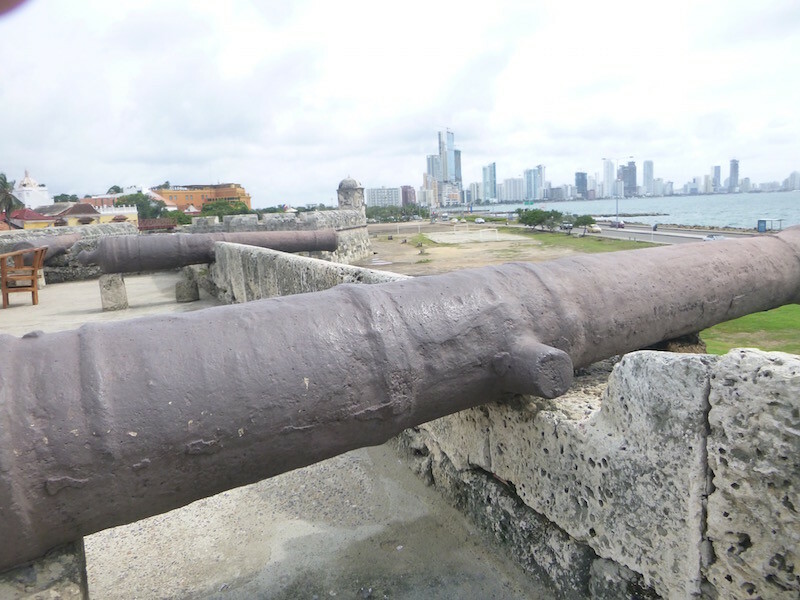 Monday is a holiday in Colombia…believe it or not, it’s Columbus Day, just like in the U.S. Almost everything is closed for the day, and the crowds are non-existent, until the cruise ship pulls up. The pigeons were unaware of the holiday. 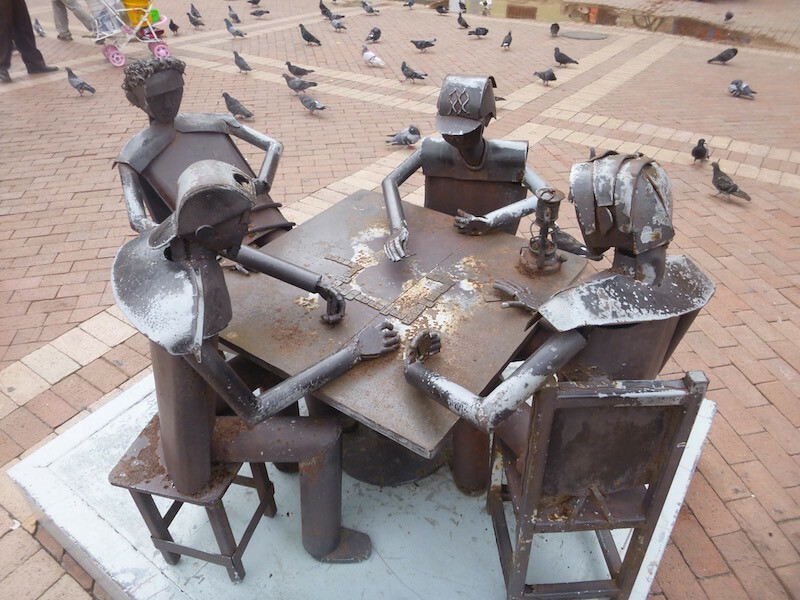 So were these guys playing dominoes. Longest. Game. Ever. That old Colonial feel…again like the French Quarter in New Orleans. My sense of humor. Love it. 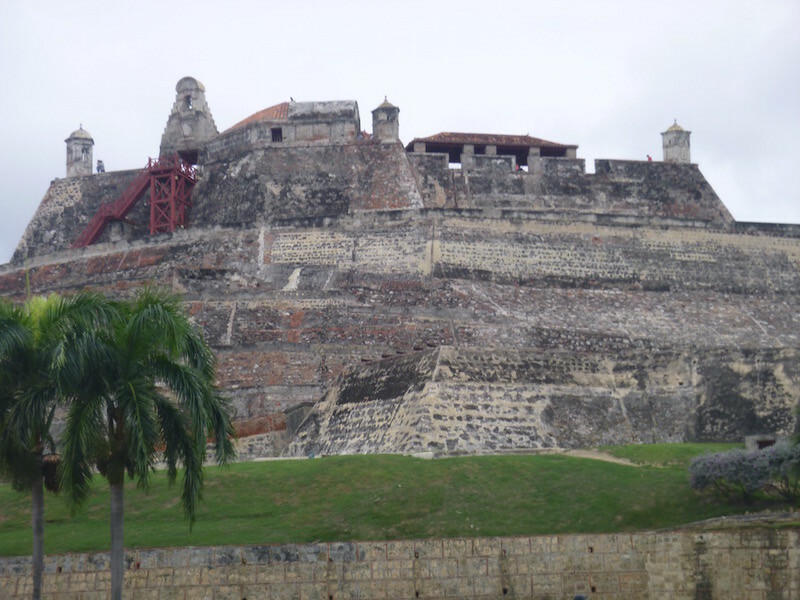 Castillo de San Felipe. This sets a new record for me for the total number of rocks glued together in one place. 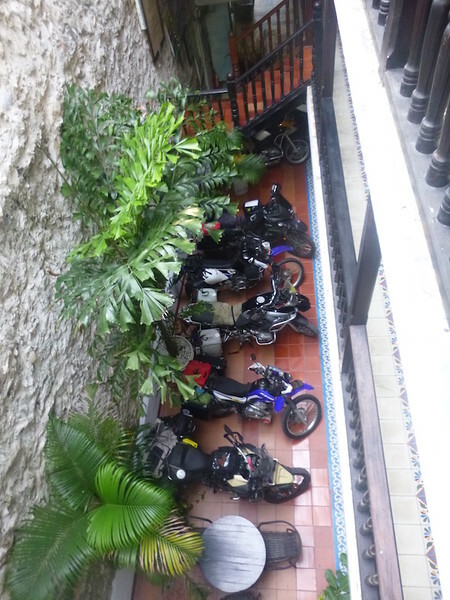 The morning after arriving in Cartagena we catch taxis back to the harbor at 6am to begin unloading the bikes. They are taken off the ship six at a time and placed on a large flat barge, then motored to shore. We’re instructed to take only our helmets and boots and to leave the rest of our gear onboard for now. We are headed directly to DIAN (Aduana, or Customs) to have the bikes officially admitted into the country. It’s a short six block ride to Customs. They open the gate at 8am and we file in. By 9am we have our bikes inspected and are told to return at 2:30 to sign the paperwork and pick them up. This would take a couple of hours if I was traveling solo, but the sheer volume, combined with the official government work pace, requires a bit longer today. So it’s back to the hotels for a few hours to wait. At 2:30 we’re all back and within a half hour we’re all officially legally in Colombia and free to go, although we still have to buy SOAT, the mandatory insurance, which costs about $30 for 90 days. It turns out the nearest SOAT office only sells motorcycle insurance between 8am and noon, so that will have to wait one more day. We leave DIAN as a group and head back to the docks one more time, to retrieve all of our gear from the Stahlratte. 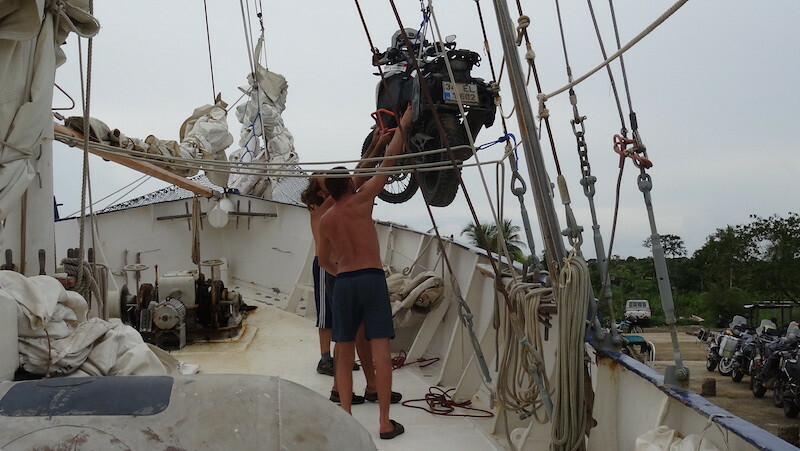 It takes three trips with the dinghy to bring all of the panniers, tank bags, riding gear, etc from ship to dock. 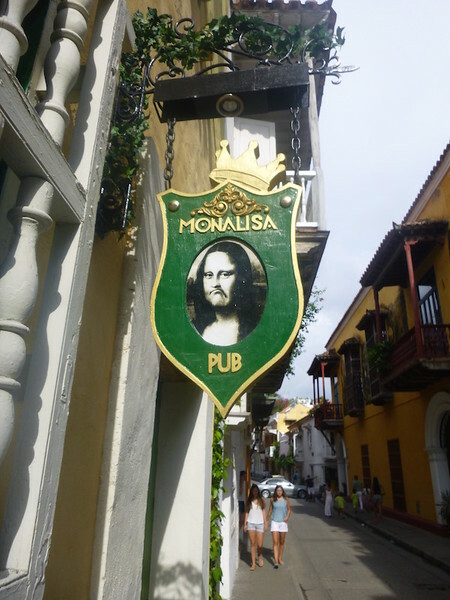 We meet up for a couple of evenings at the Mamallena Hostel on Media de Luna street (come to think of it, a very fitting name for the main street through the red light district) for drinks and to swap travel stories. It’s definitely an interesting group, and everyone has a different reason or plan for their trip. Most are traveling much faster than I am, as their goal is Ushuaia — the southern tip of South America — and most only have until the end of the year before they have to return to jobs. A few of us are going further, and the same people seem to be traveling slower. I find that John and Bev (British couple on XT600s) are on a similar pace and we discuss the possibility of shipping to Africa together in March. There is no doubt that several of us will cross paths again on the way south. Most leave Wednesday morning headed straight for Medellin — a two day ride. The few stragglers that stay behind another day meet up again at Mamallena, and as I walk through the lobby, there are two blue KLR650s parked there. 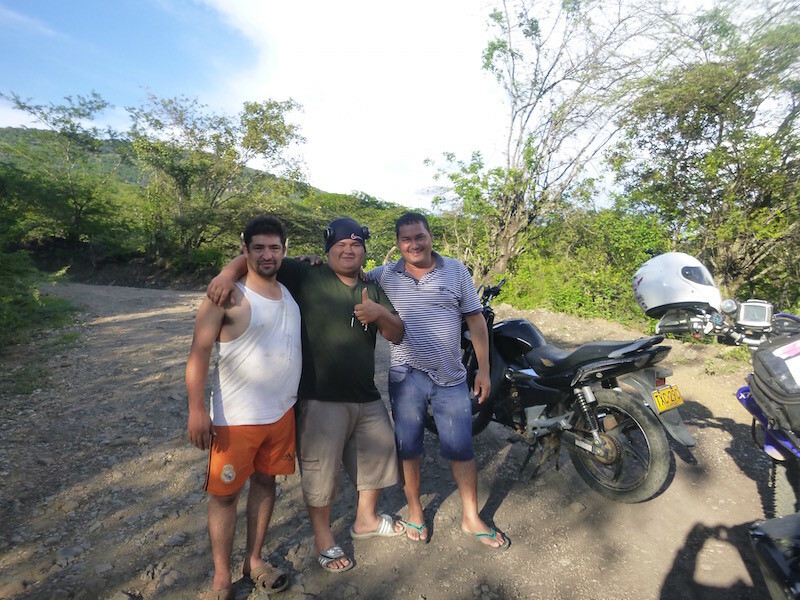 It’s the two Canadians that I met on the ferry to Ometepe Island in Nicaragua, and again in Boquete, Panama. They have just arrived on the Wildcard, a smaller sailboat. 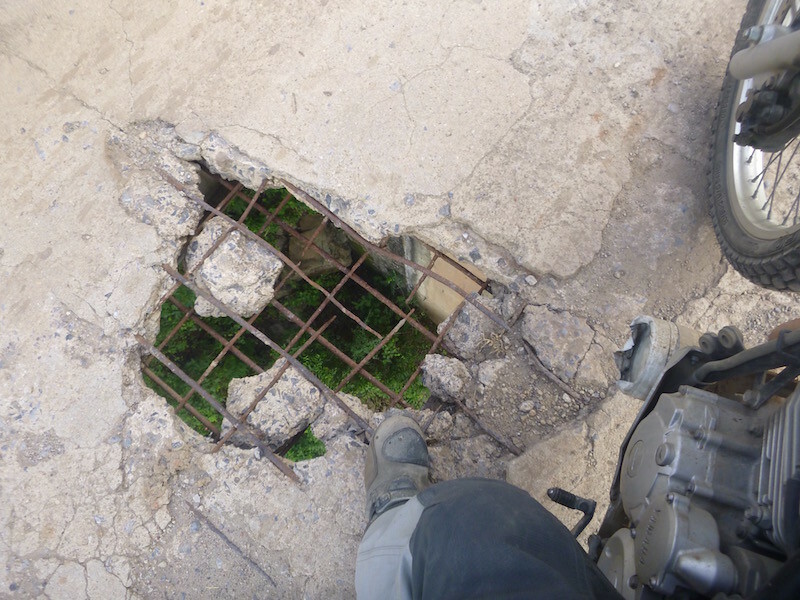 The Gringo Trail continues to funnel motorcyclists through the same areas. At 7am I’m leaving my host family in Panama City and heading to Carti. It’s morning rush hour and I’m on the opposite side of town. I have to split lanes through freeway traffic for several miles before the road opens up. I woke up this morning with an ear ache and it isn’t getting better, and it isn’t helping my balance as I thread between cars. It’s been a few years since living in Southern California and my lane-splitting skills are a bit rusty anyway, but fortunately people here are used to motorcycles sharing the lanes with cars. 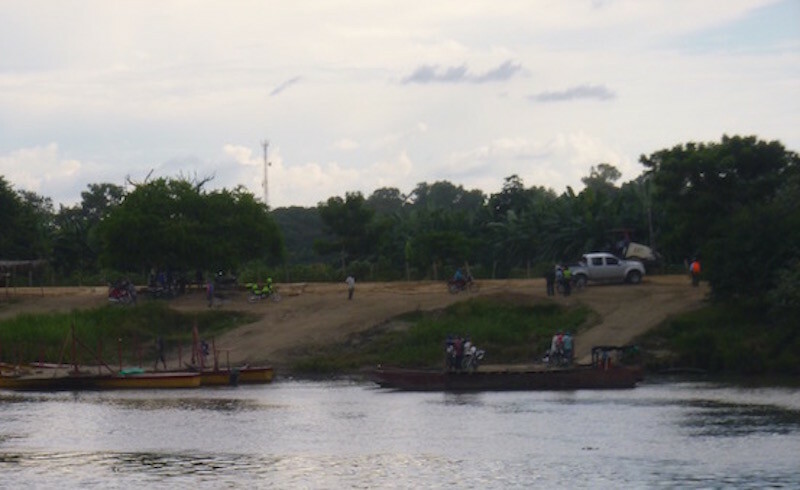 About sixty miles from Panama City I turn left onto a small road towards the Kuna Yala lands. These indigenous people and their lands are technically separate from Panama, and about 12 miles down this steep, twisting road I come to a road block where I have to pay my “Kuna Tax” to continue. Another ten miles or so and as I crest a hill the Caribbean comes into view. Not long after, the road ends at the harbor, which is really just a place for the Kuna to launch their fishing boats. There is a concrete pier here, and there are already eleven bikes on the dock waiting. Within a few minutes more arrive. The Stahlratte is anchored just a couple hundred meters away. The 120-foot steel schooner was built in 1903, and has seen several different lives prior to its’ current use. Arrival at Carti pier, with the Stahlratte in the background. I walk the pier to have a look at the bikes. There are several BMW 1200GS models, an F800, a Kawasaki KLR, a KTM 1190 Adventure, a Triumph Tiger, a Suzuki V-Strom, a couple of XT600 Yamahas, a Honda Transalp, a Honda Africa Twin, a Suzuki DR650, Judith’s DR-z400, and my little Yamaha 250. Eighteen bikes and twenty three people, from England, Australia, Canada, the U.S., Romania, Turkey, Germany, Austria, Switzerland, Italy and the Netherlands. Most started their journey in Alaska, and intend to finish in Argentina. A few are going further and/or have been further already. The ages range from around late twenties to mid sixties. 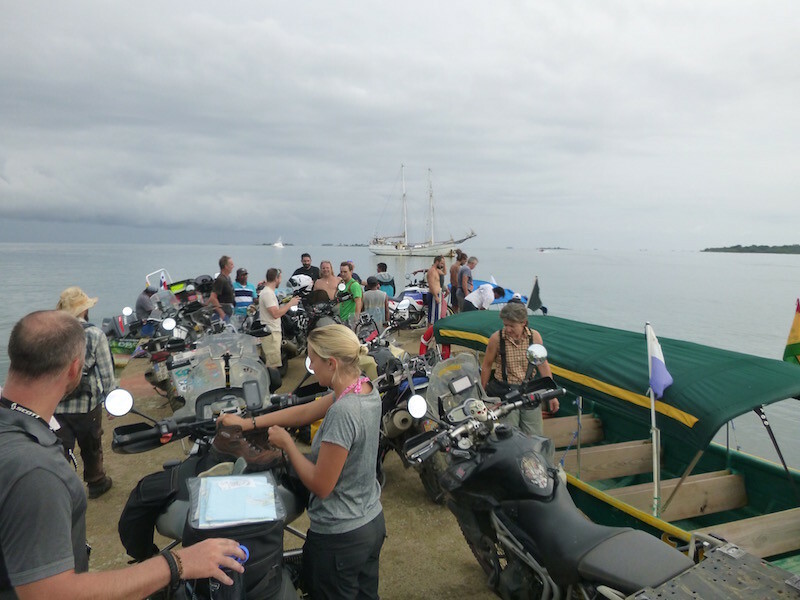 The crew loads the bikes onto the ship while we take a small boat to our hotel for the night on a small Kuna island about 20 minutes from the dock. 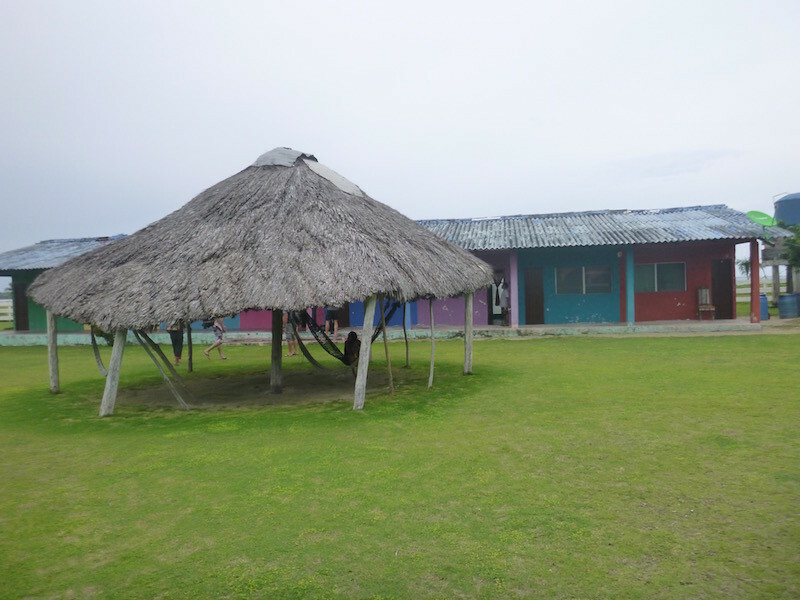 The island consists of little else besides the small (20 room) homestay hotel and a short air strip. Our hotel shuttle to and from the Stahlratte: powered by twin 40hp Yamahas. Headed to our hotel for the first night. 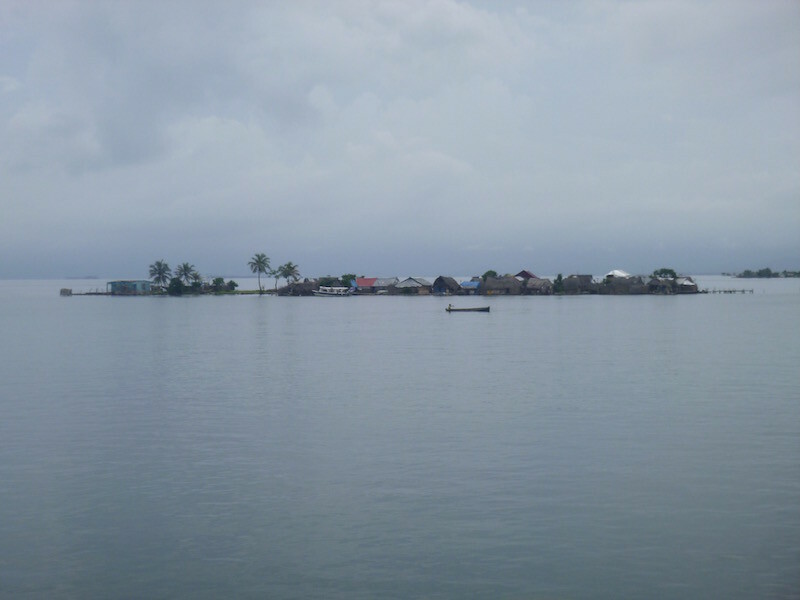 There are several islands nearby that are inhabited by Kuna people. Some of these are densely built out. 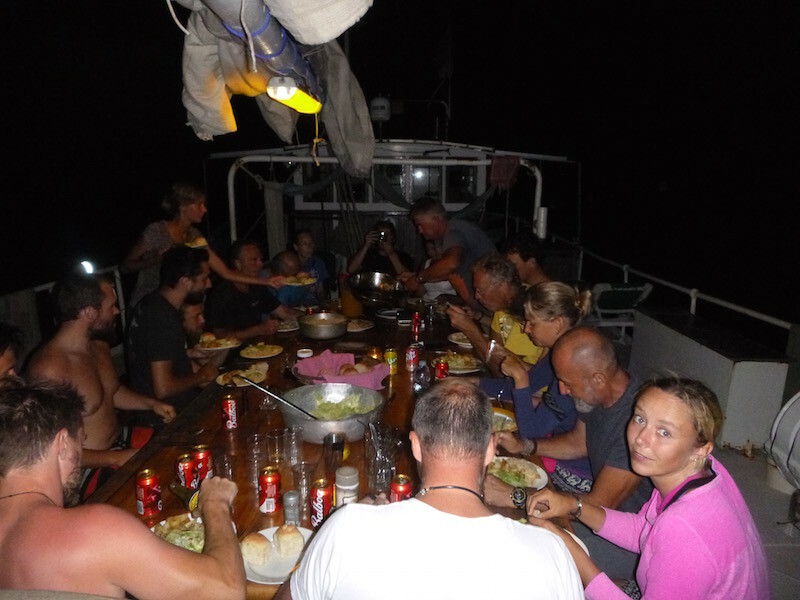 First night’s stay at Hotel Porvenir while the crew prepares the Stahlratte for sailing. 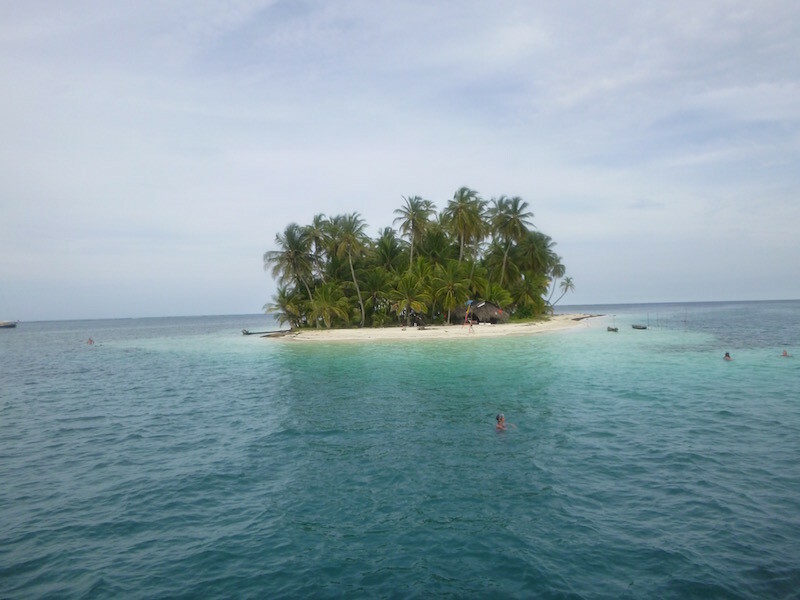 We’ll leave the next morning for the San Blas Islands. 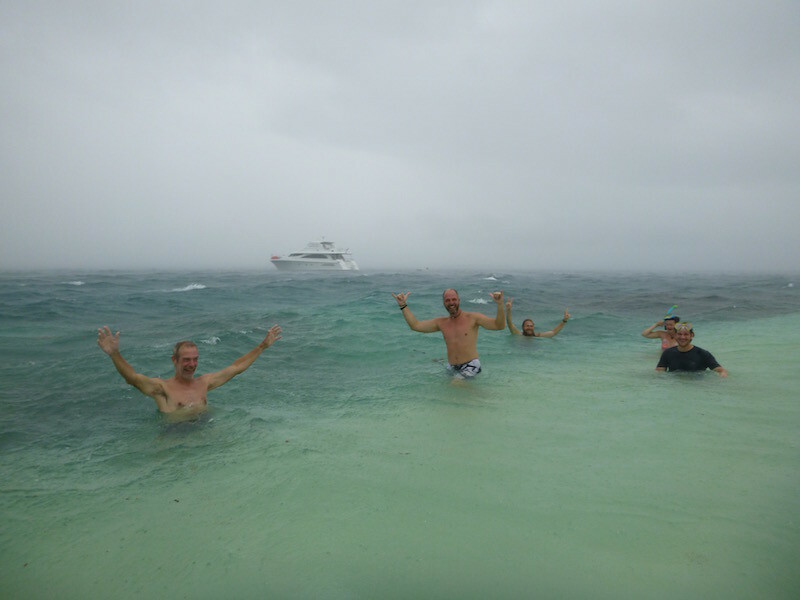 In the morning we take the shuttle back to the Stahlratte and have breakfast before sailing three hours to a spot in the San Blas islands. 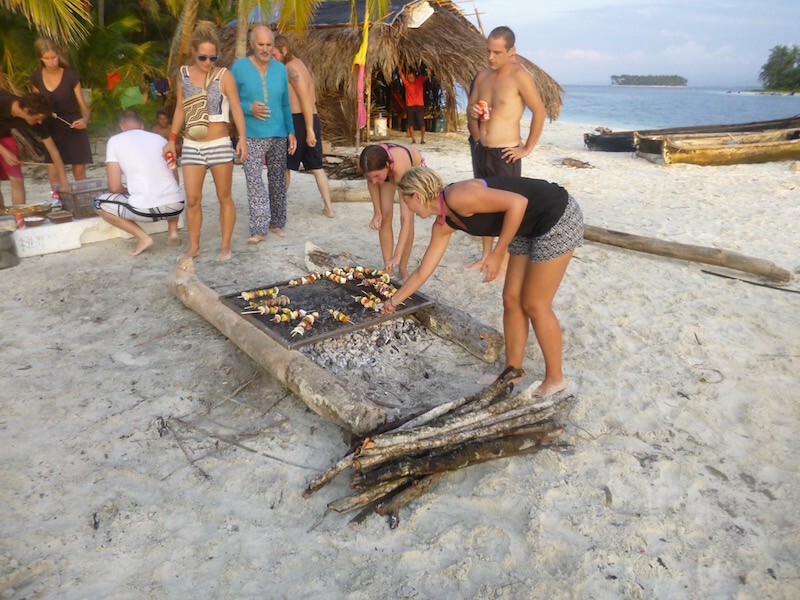 We stay here for the next two days, with a BBQ and bonfire the first night in the islands. The ear drops aren’t working, and I’m a bit bummed that I can’t dive or really do anything in the water. But the place is so beautiful it doesn’t really matter. Some climb to the crow’s nest for an even more stunning view. 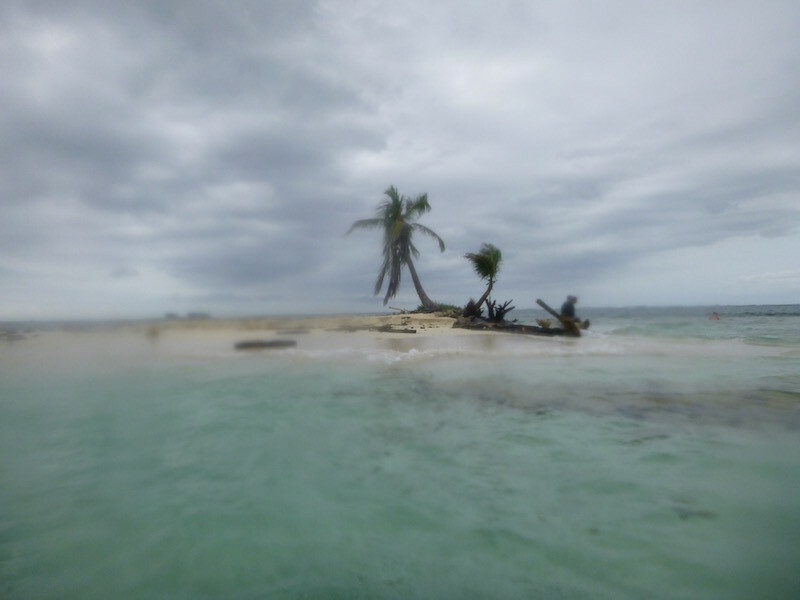 There are 365 islands in the San Blas Islands, and only a handful are inhabited. Many look like this. 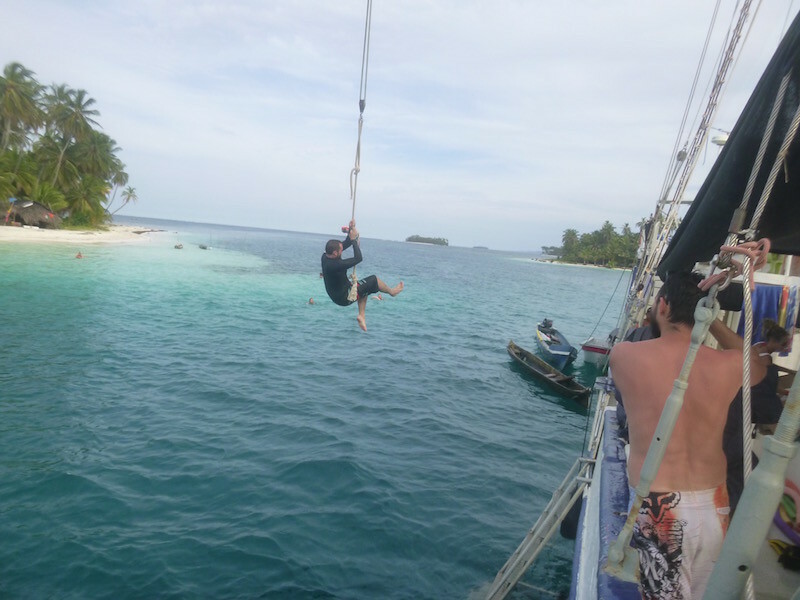 On-board entertainment system: Swinging from the ship. This was our dinner location. You arrived by dinghy or by swimming. BBQ, bonfire, beer, rum. Very relaxing. 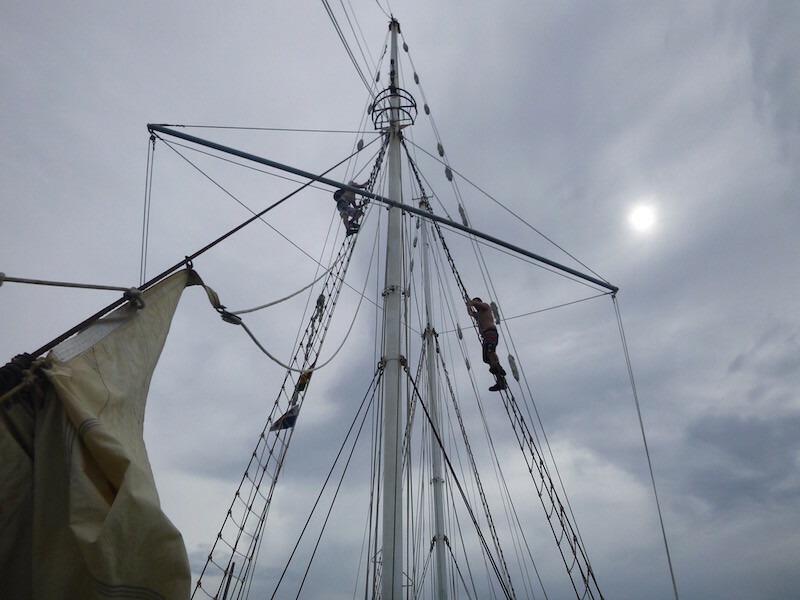 It’s muggy below deck, so I spend part of the first night on the Stahlratte in the hammock over the bowsprit. The small LED lights on the masts light the water below me just enough to watch eagle rays swimming by. Graceful and beautiful to watch in the dark silence. 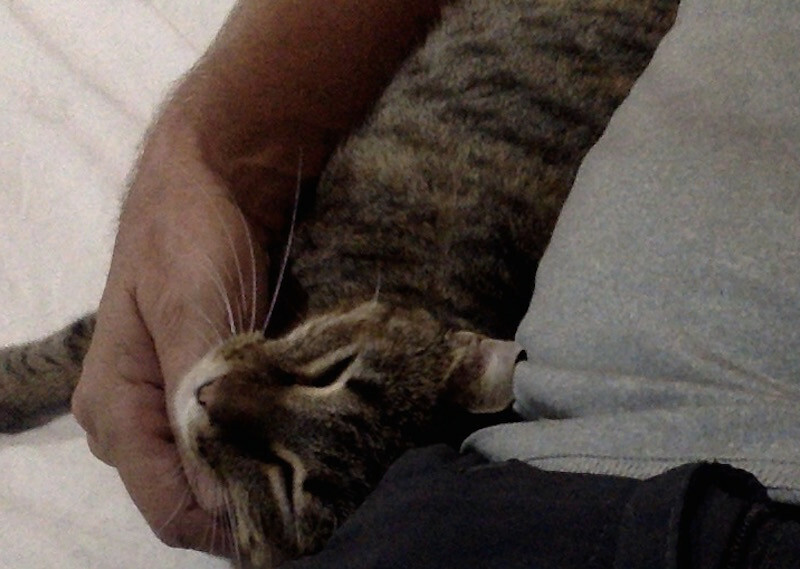 Eventually it cools off enough below deck and I climb down to go to bed just before a rainstorm moves by. 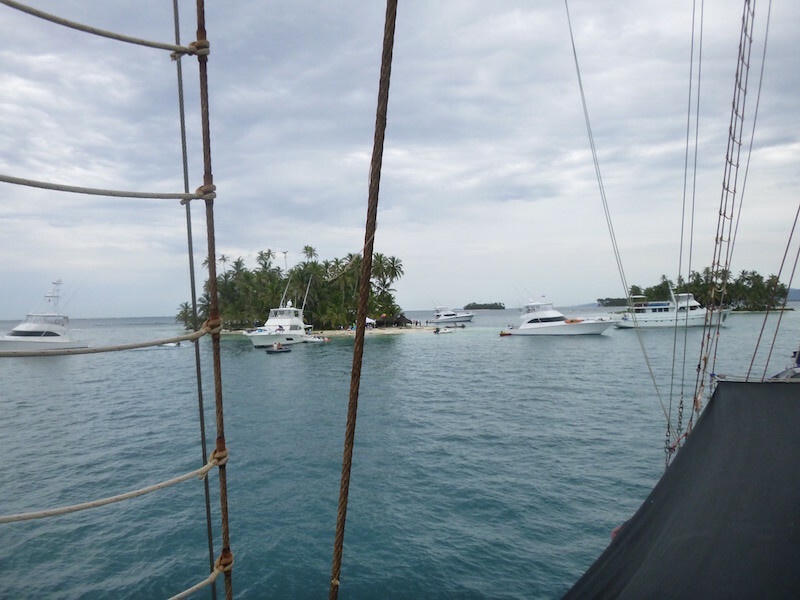 The next morning is Saturday, and we awake to find our little paradise taken over by Panamanian yachts. Weekend local party boats. By afternoon they had all cleared out and gone home. There are four or five islands within swimming distance or a short launch ride. 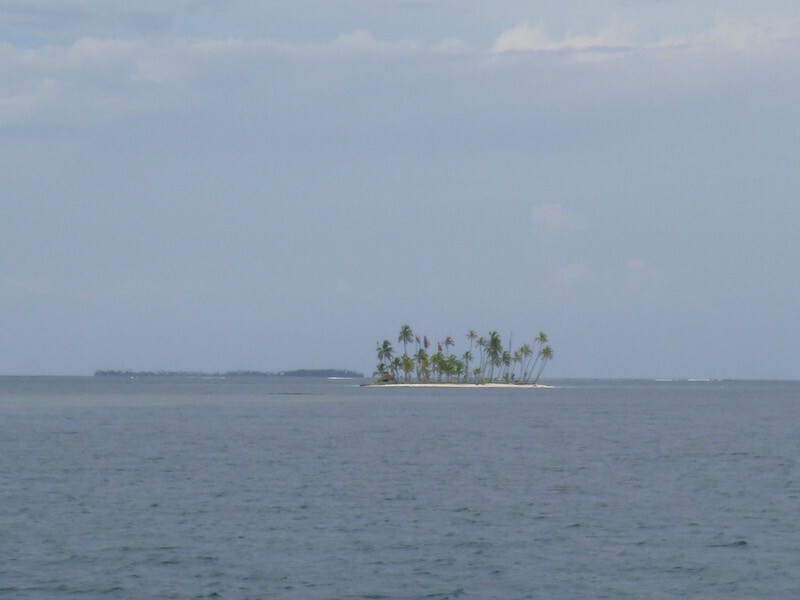 One of these is the stereotypical “stranded on a deserted island”: about 80 feet in diameter with a lone palm tree. Several of us venture out here one day and within minutes a gale blows in. The rain is blowing so hard it hurts and it feels better to be in the water. It pours but is over quickly. Sudden deluge. The rain stings, but the dinghy arrives to carry us back to the Stahlratte, and the storm passes quickly. Dinner on board our cruise ship. At five o’clock the next morning the 65 year old diesel engine fires up, and we begin the thirty hour trip to Cartagena. At 280 rpm, you can actually count each piston stroke by sound and vibration. 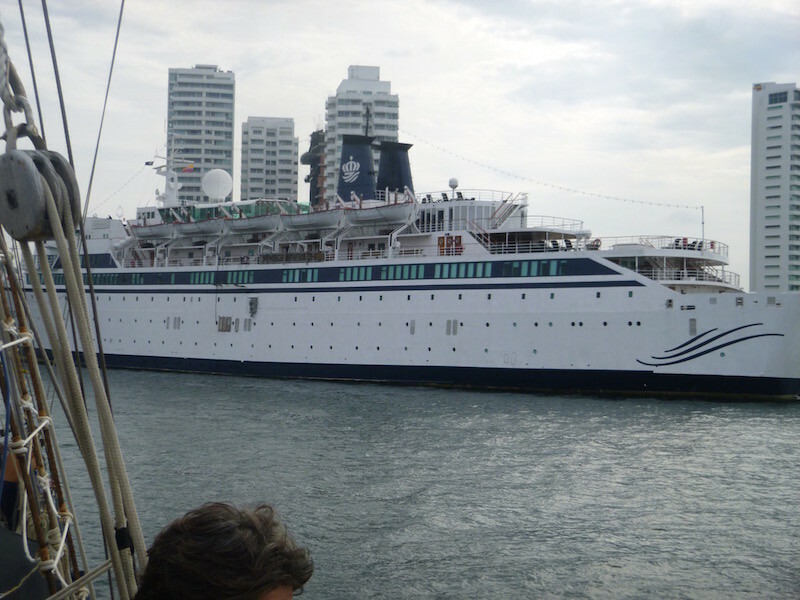 Within the first few hours most of the people on board are seasick. Only a few of us have taken Dramamine before heading to open seas, and it pays off. For the next day, people are much more scarce at meal time, and tend to spend more time in their berth or lying down on the deck. 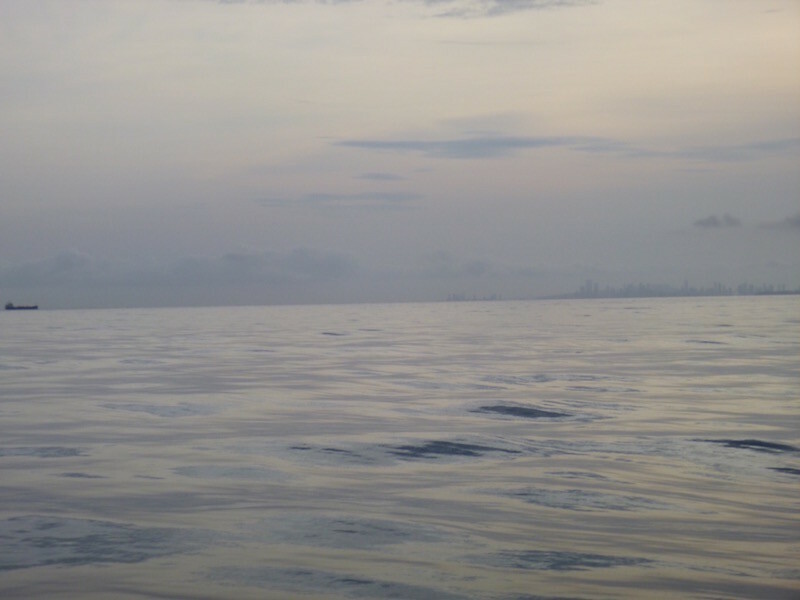 At sunrise the next day we awake to what looks like wafting glass seas and the Cartagena skyline in the distance. 6am: Cartagena in the distance. 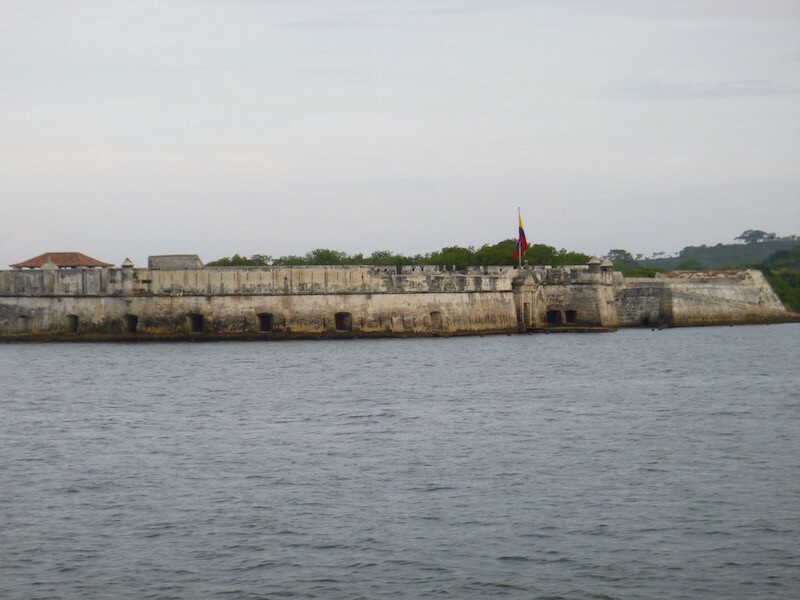 We pull into the harbor at Cartagena, past the old fortress walls. 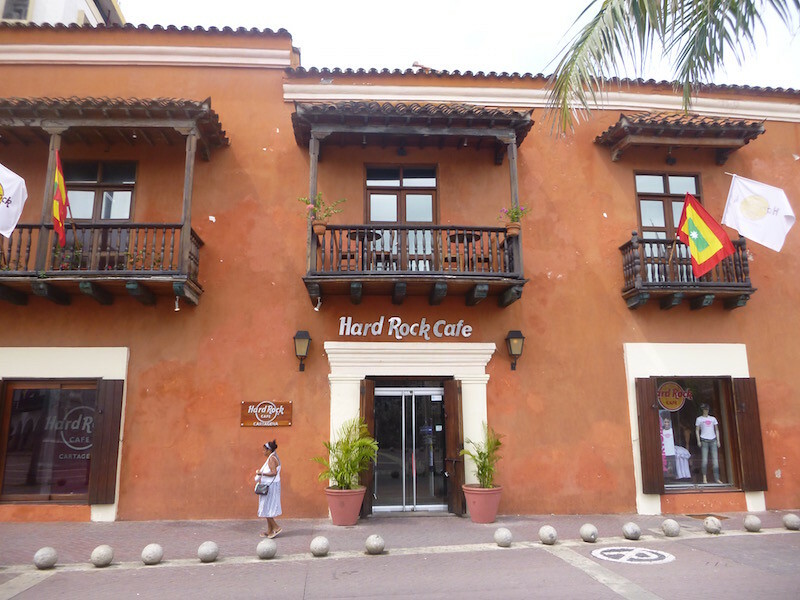 After breakfast we are taken to hotels and hostels in the old part of Cartagena, where we will stay for a couple of nights while the bikes are unloaded and taken through the Customs importation process. Passing the centuries-old fortress walls coming into the harbor. The buffet boat following us in. 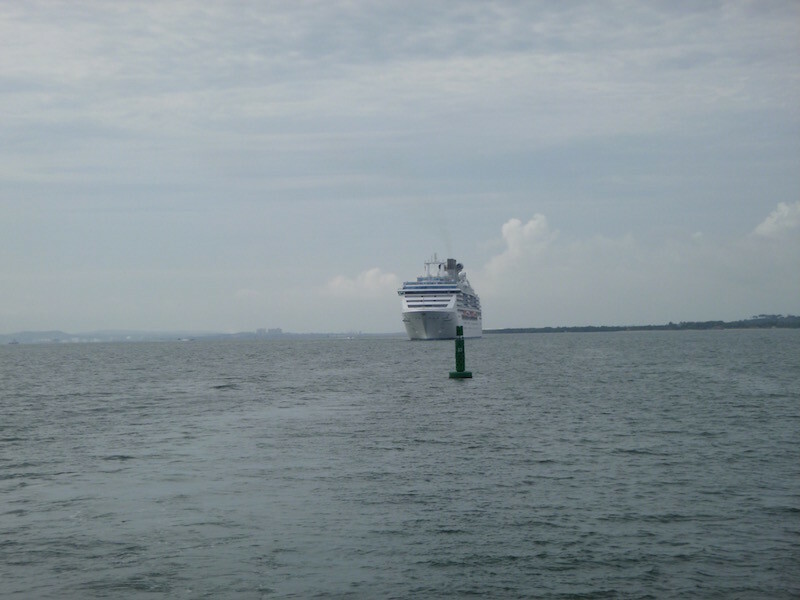 In the harbor, we anchor next to the FreeWinds. This huge ship is owned and operated by a church. Can you guess which church owns it? Hint: It’s a “Tom Cruise” ship. My little 250 leaned against a Honda Transalp, ready to be unloaded. Hoisted off the Stahlratte onto a floating platform, the bikes are transported six at a time to land. Taking the bikes to shore. 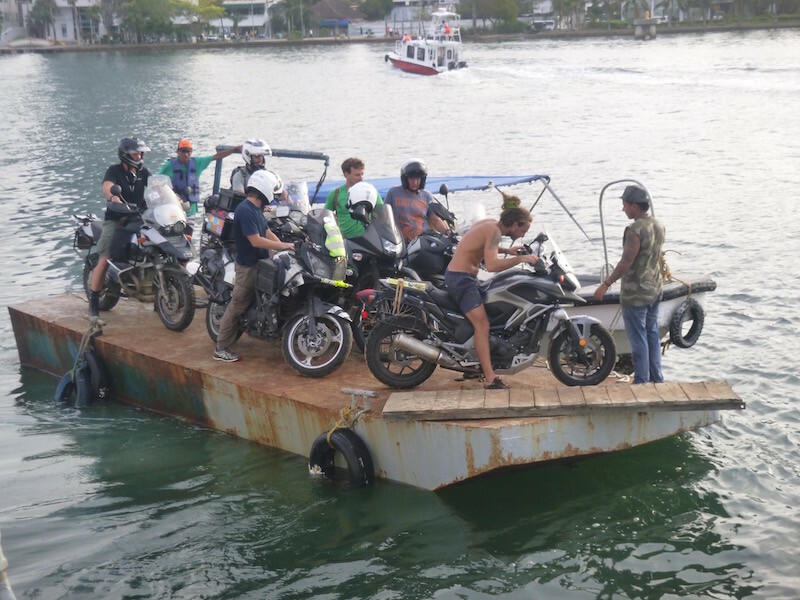 No dock…they pull right up to the concrete boat ramp, then use that wooden pallet ramp and you ride off onto and up the boat ramp. Once everyone is through Customs and Immigration the following day, we are free to ride to our hotels. Here’s the lobby at the hotel where I’m staying. The food on the Stahlratte is great and plentiful. This is not a cheap way to ship between continents but it is definitely worth it. 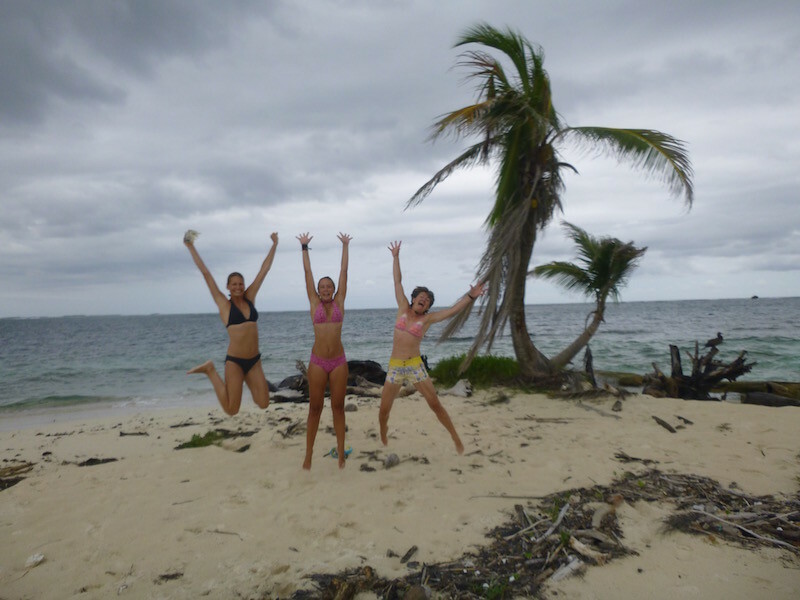 The experience of the ship, the San Blas Islands, and the other travelers and crew isn’t found everywhere, and while you could save a few days but spend the same amount of money air-freighting your bike to Colombia from Panama, you would miss out on some memories of a lifetime. 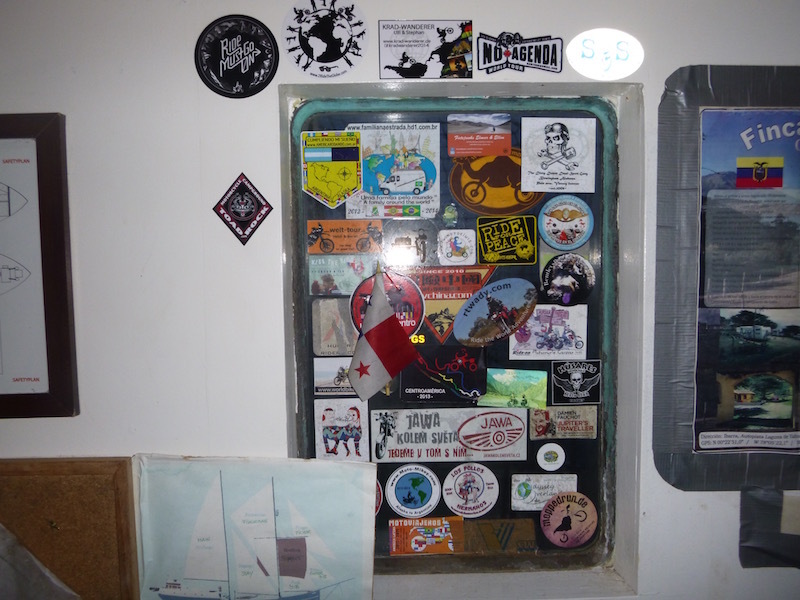 Upper left, above the window: 2RideTheGlobe.com is now part of the Stahlratte experience. 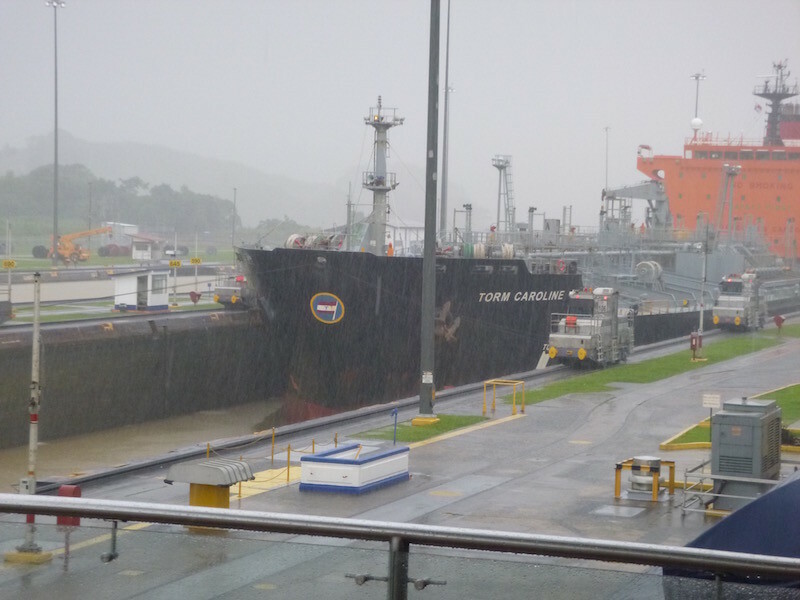 It rained heavily again Tuesday afternoon, so I spent all afternoon at the Miraflores Locks Visitors Center learning about the Panama Canal and watching ships pass through the locks. It’s an impressive sight. 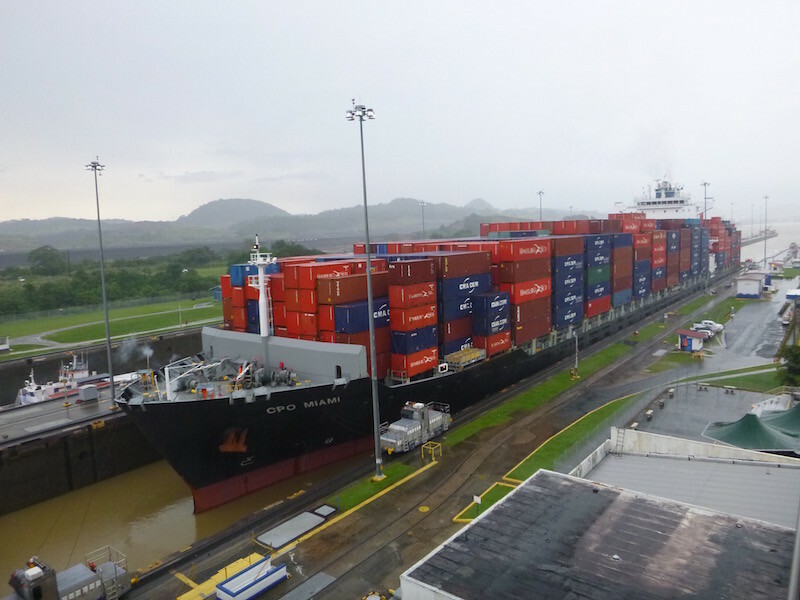 A huge freighter with only two feet of clearance on each side between ship and canal, being lowered twenty seven feet in six minutes. 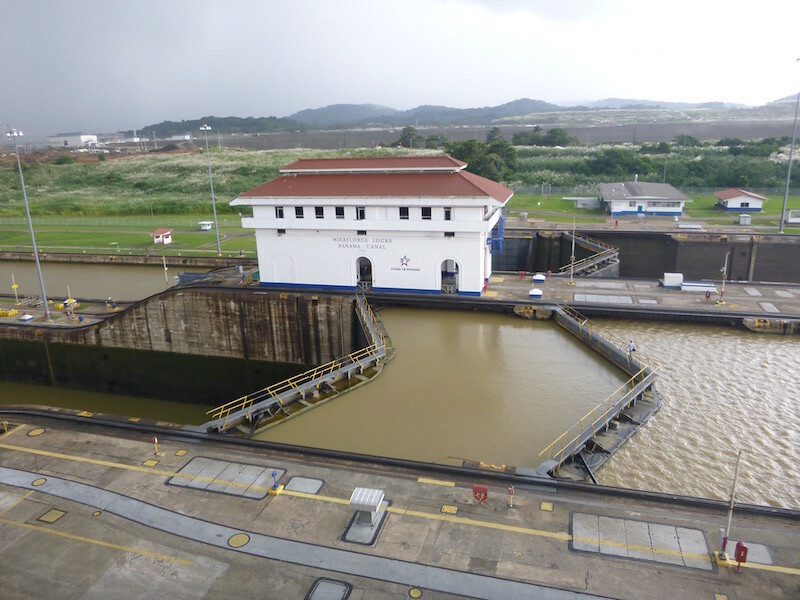 The speed and efficiency is amazing, from approaching the locks to exiting the second stage of the locks all within less than an hour. 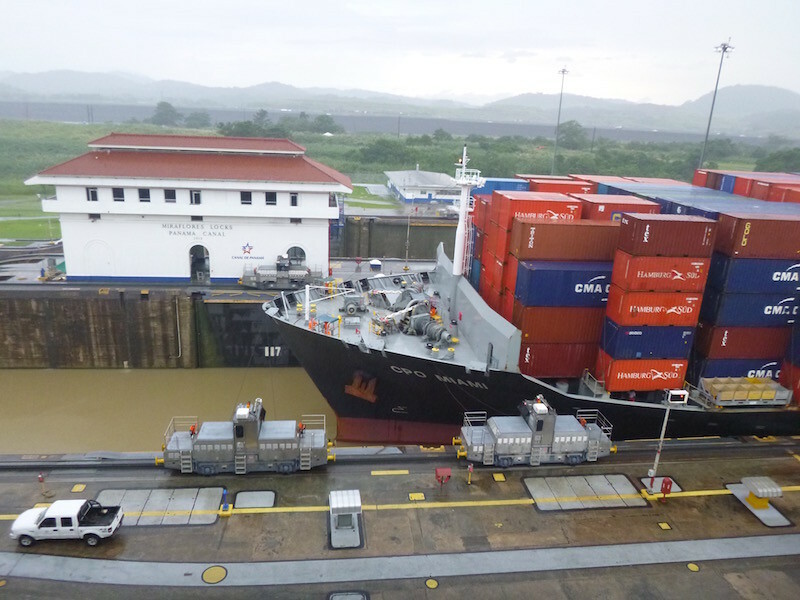 Set of double gates between the first and second stage of the Miraflores Locks. These are the original gates built in 1914 in Pittsburgh. Each weighs 600 tons. Tug guiding the tanker Torm Caroline into the locks. Not raining yet. 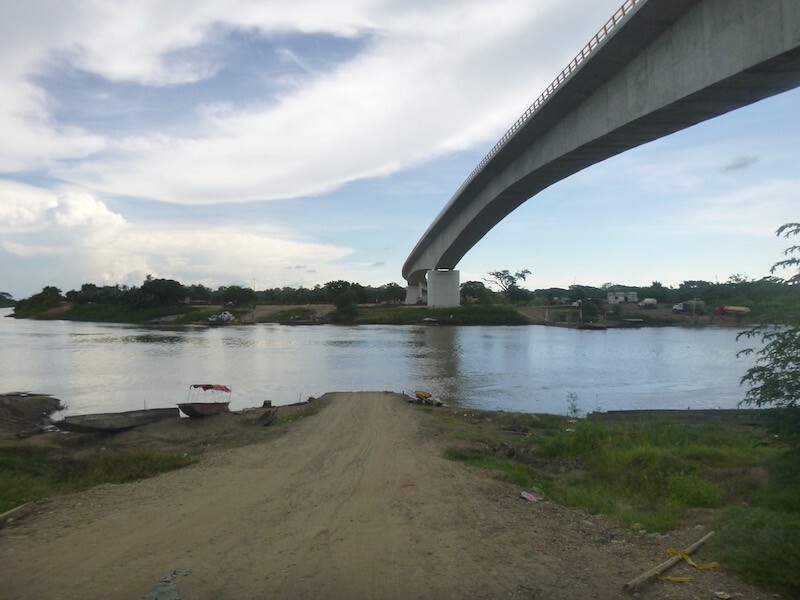 Paraiso Bridge in the background — I crossed over the canal on this bridge last Thursday coming into town. BAM! Now it’s raining. This is what last Thursday was like as I was riding into town. Tanker in the first stage of the locks. 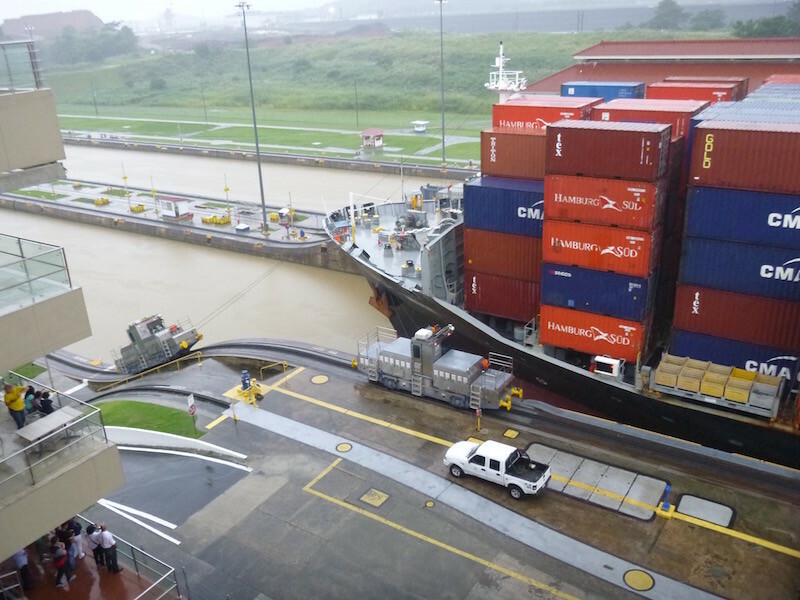 Water height is all the way up and the deck of the ship is quite a bit higher than the edge of the locks. Water pumped from the first stage to the second stage of the locks at over 300,000 gallons per minute. 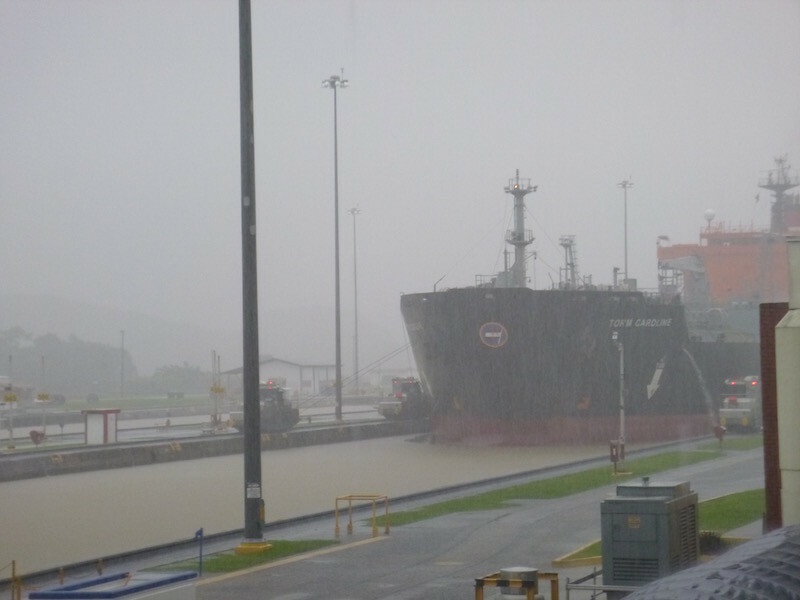 In six minutes the ship is lowered 27 feet. Tanker deck is now at road level, gates open and transferred to the second stage where it all happens again. 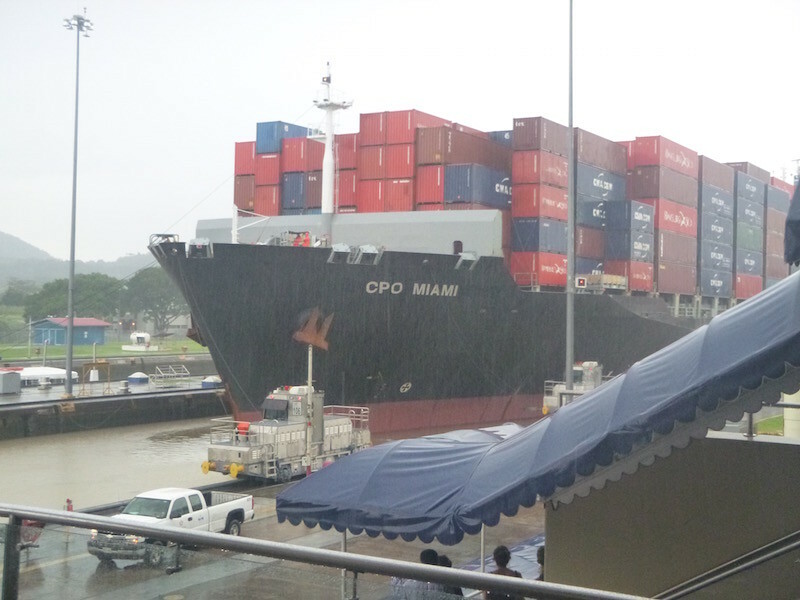 Next up, the CPO Miami, a large freighter. 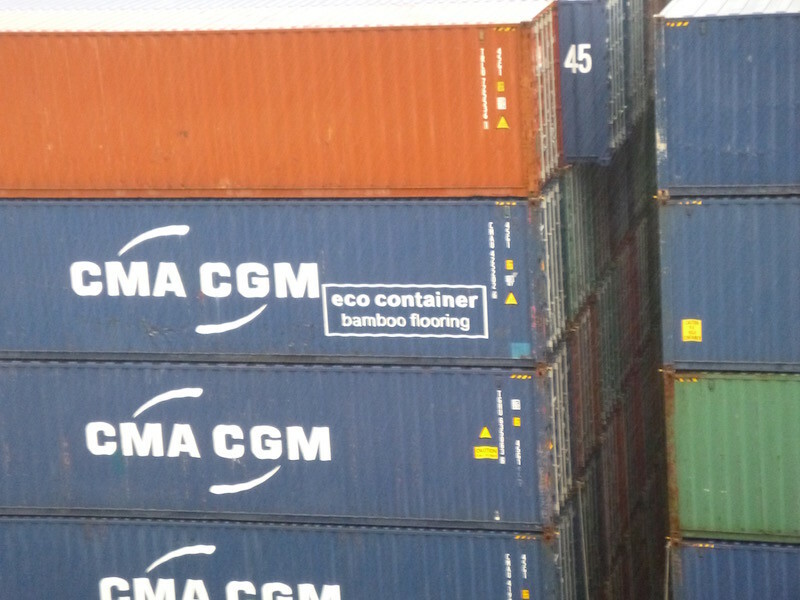 I counted around 1200 shipping containers above deck. Lowering in the first stage. Passing through the gates. 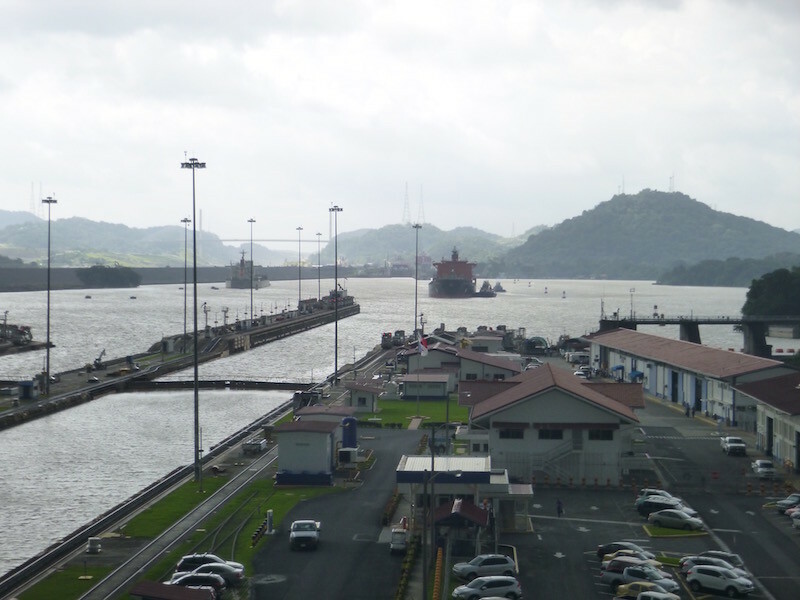 There are six locomotives attached to the ship to keep it in position, with only two feet on each side between the ship and the canal. The only place I’ve ever seen a locomotive go downhill at a steep angle. They have to adjust their height as the ship is lowered another 27 feet in the second stage. One locomotive at the rear on each side. 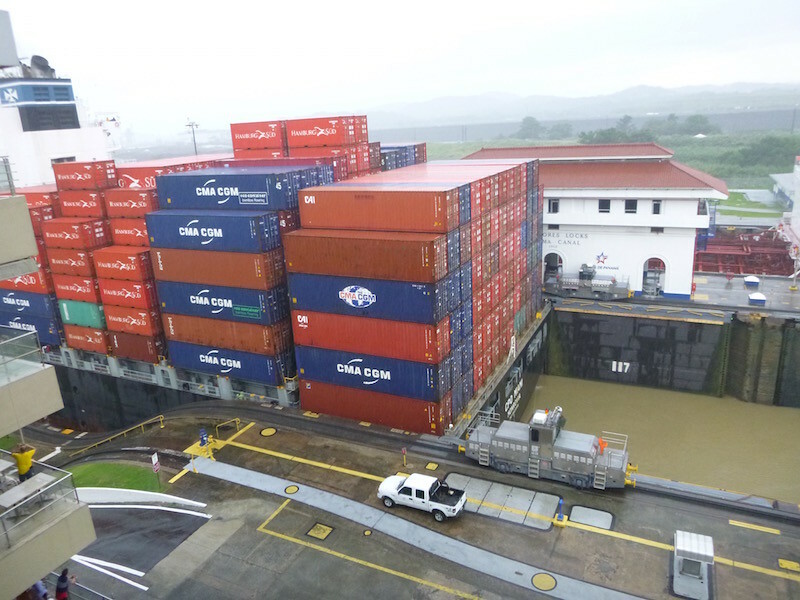 That is one huge stack of containers. 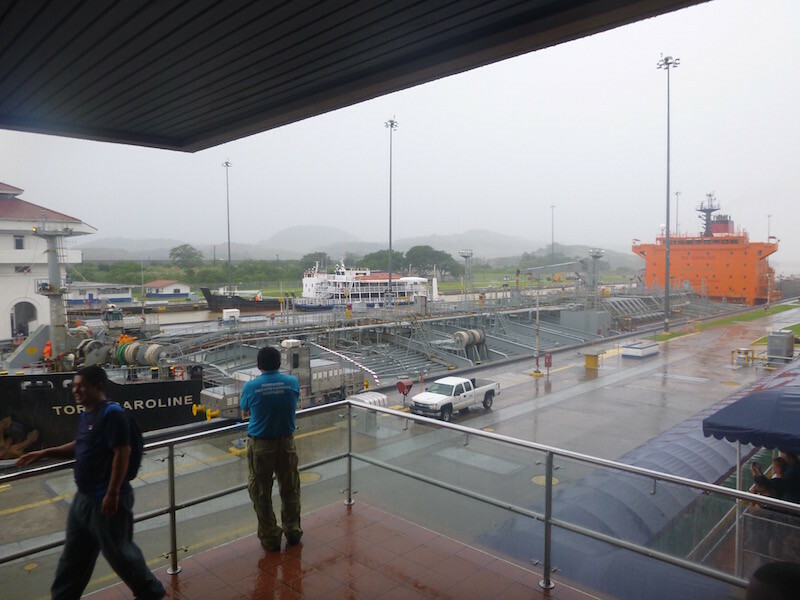 I’m writing this a bit early, as tomorrow morning I have to load up and leave early to ride a couple of hours to Carti, Panama. Carti doesn’t show up on many maps, and in fact even if the town name shows up, it’s likely that the road to it doesn’t show up, or Google Maps tells you it “can’t calculate a route between Panama City and Carti, Panama”. In any case, I have to meet the Stahlratte and its’ crew at 11am on Thursday morning to load my bike, along with ten other bikes all bound for Cartagena. In case you weren’t aware, there is no highway connecting Central and South America. 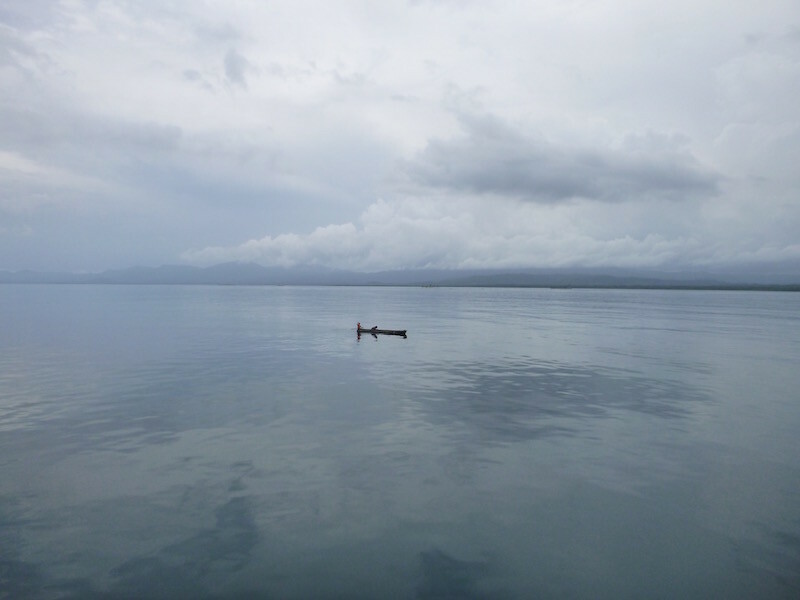 The Darien Gap is a 99-mile long stretch of jungle with no road between Panama and Colombia. Yes, a couple of people have traversed it in the past. Literally a couple. And it took them a looooong time. 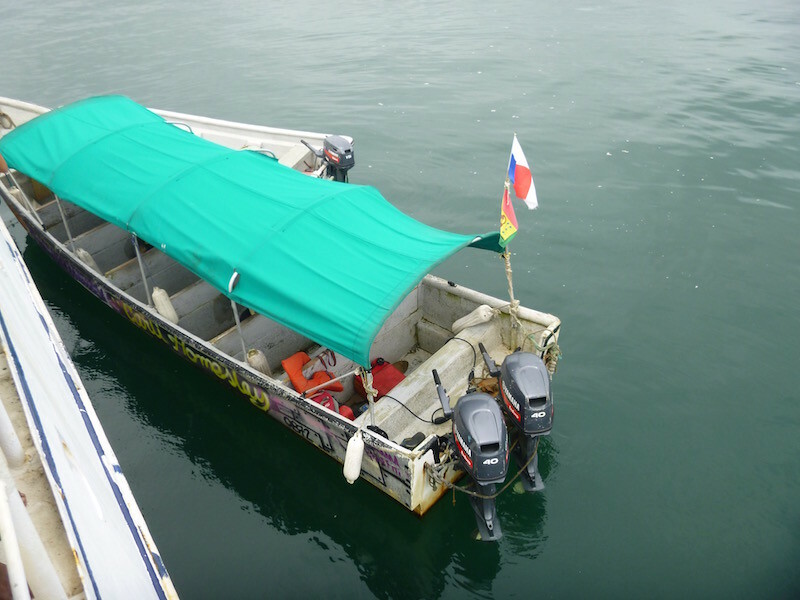 There are basically two ways to get to South America with a motorcycle: put it on a boat, or put it on a plane. Neither is cheap, and both require you to purchase a ticket to get yourself there as well. The plane goes to Bogota, which is near the center of Colombia and not where I was looking to start my South American travels. It’s quick, but requires crating and isn’t very entertaining. 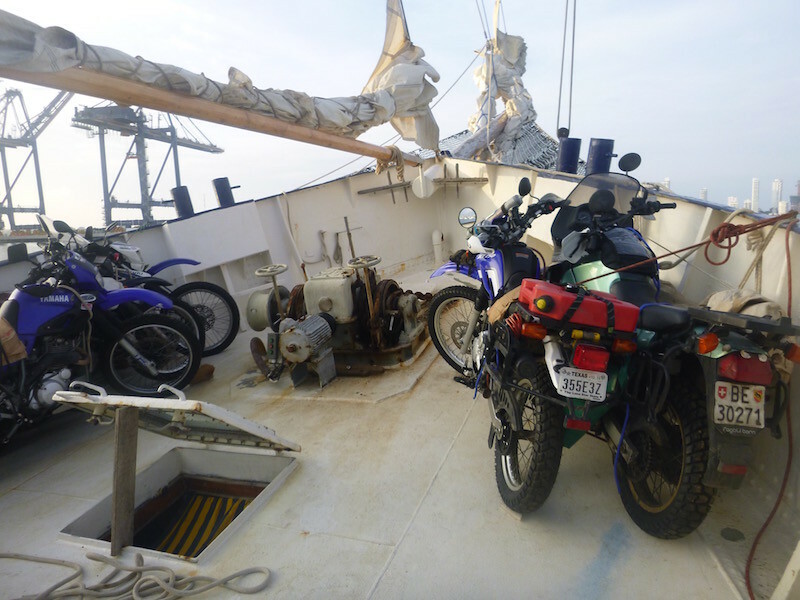 The cargo ships are cheaper, but slow, make many stops, and you can’t be sure when the bike is going to show up. That leaves the sailboat option. 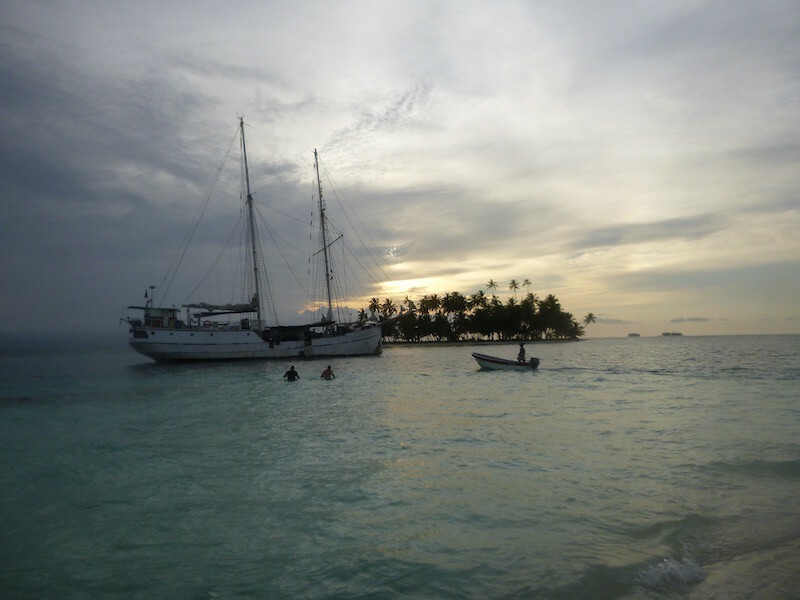 The popular route is aboard the Stahlratte (German for “Steel rat”), a 110 year old ship that regularly plies the route between Carti and Cartagena, with a two day stopover in the beautiful San Blas islands. More about that in my next post when I have photos and can describe the trip. 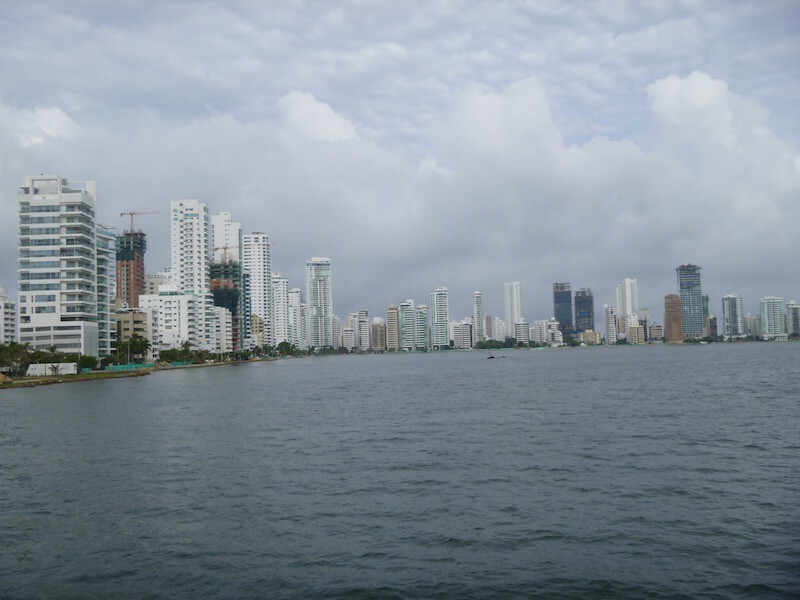 I’m scheduled to arrive in Cartagena on October 12th, and should have wifi for a day or two before heading north (yes, it sounds strange, but I will actually be further north in Colombia than I am in Panama City, Panama). The next several days after that entail a tent and beaches, so no communications access. So, hasta luego until around the 13th.